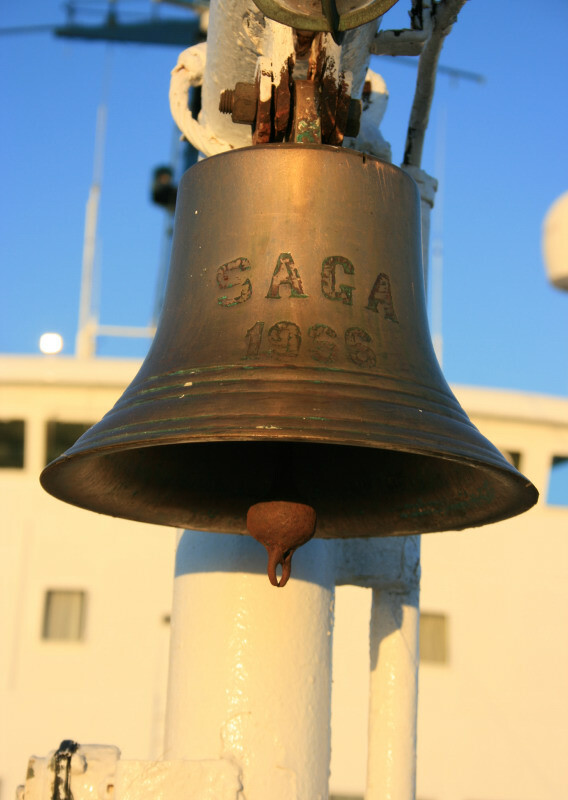 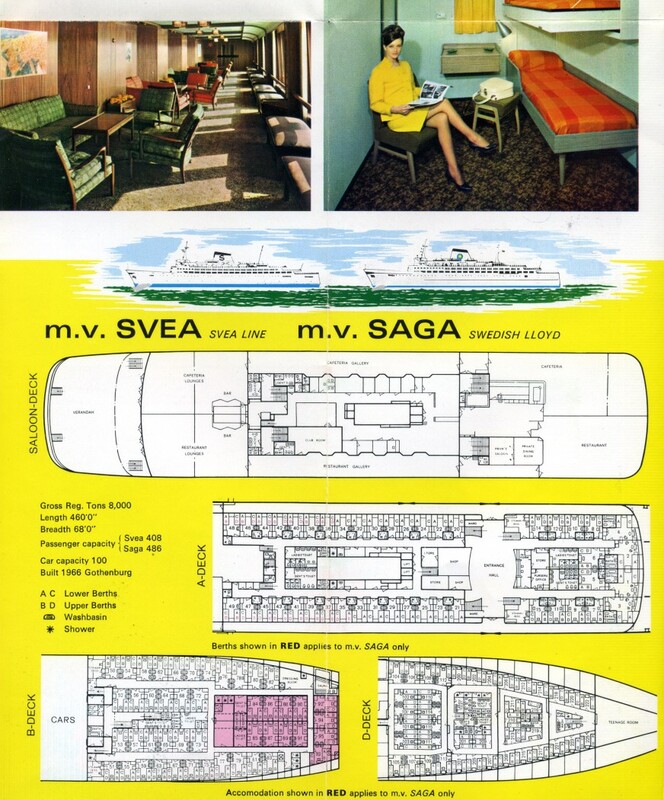 Repost of a voyage report originally posted here in 2009 but subsequently lost. In 2010 the Ivan Zajc was sold for service in Equatorial Guinea for service to the island of Malabo. She reportedly still survives (an AIS signal was last emitted in July 2015) but there is no definitive confirmation of her present location and condition. The Ivan Zajc and the Vis at Vela Luka. 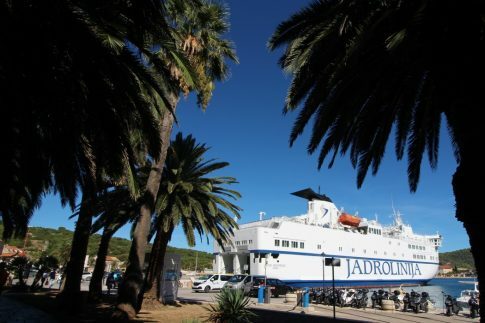 Having motored up the coast from Korcula on the little Liburnija, easily Jadrolinija’s most lovely ship, an overnight sailing from Split to Ancona on the Ivan Zajc awaited. 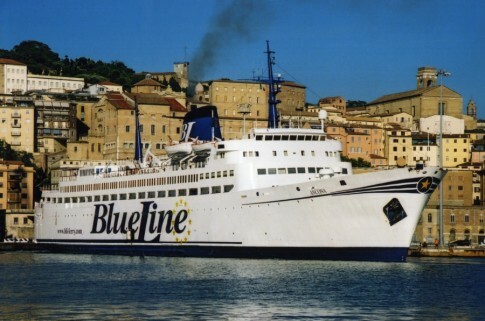 Built for the Linee Marittime dell’Adriatico in 1970 as the Tiziano the Ivan Zajc has the distinction of having passed through three separate operators while all the time operating primarily from Italy to Split, in Croatia (formerly Yugoslavia). 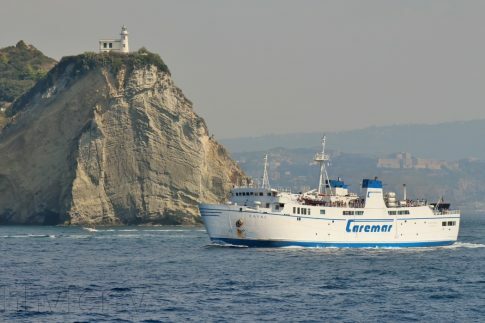 Originally operating from Pescara, she passed to Adriatica in 1980, with operations from both Ancona and Pescara as well as use elsewhere on the network on occasion. 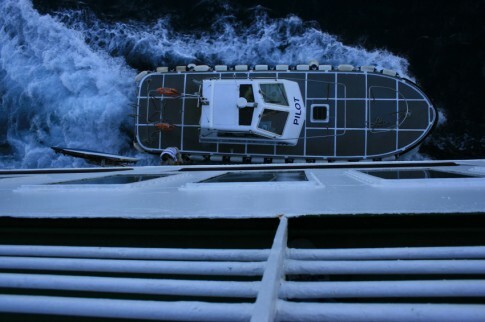 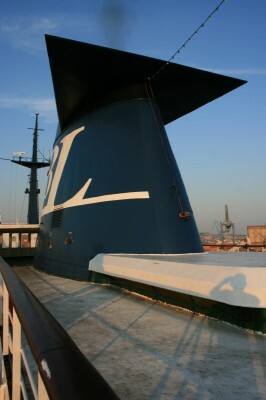 A view from astern, showing the ship's distinctive silhouette. 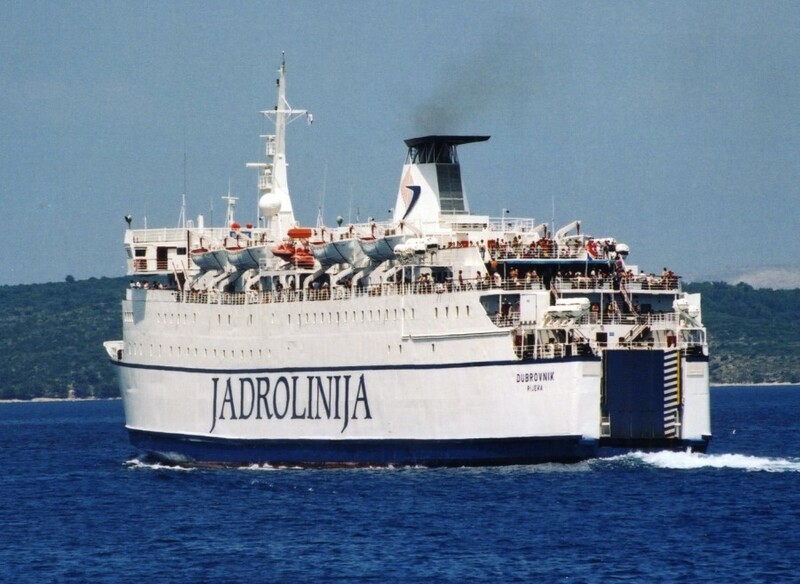 Finally, in 1993 she was acquired by Jadrolinija, acquiring her present name and being deployed largely on the Ancona run, although certain domestic sailings have also been maintained (in recent years often a daytime return to Vela Luka on Korcula island in between overnights to Italy). 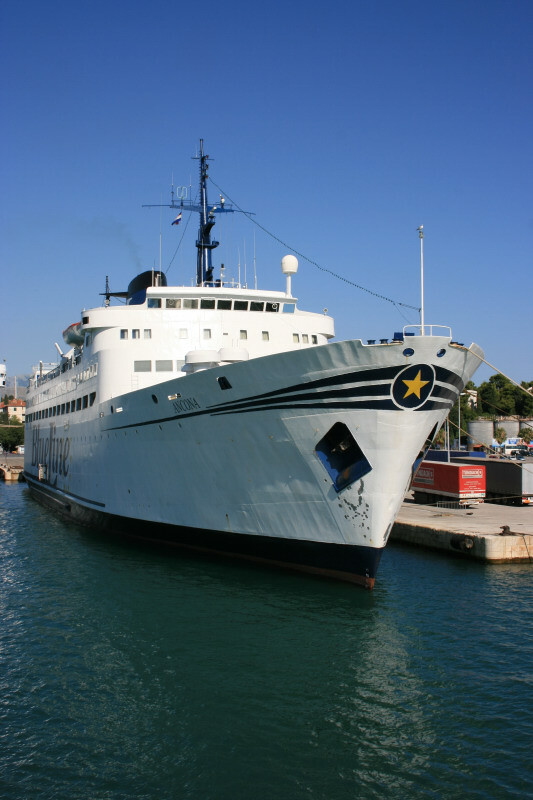 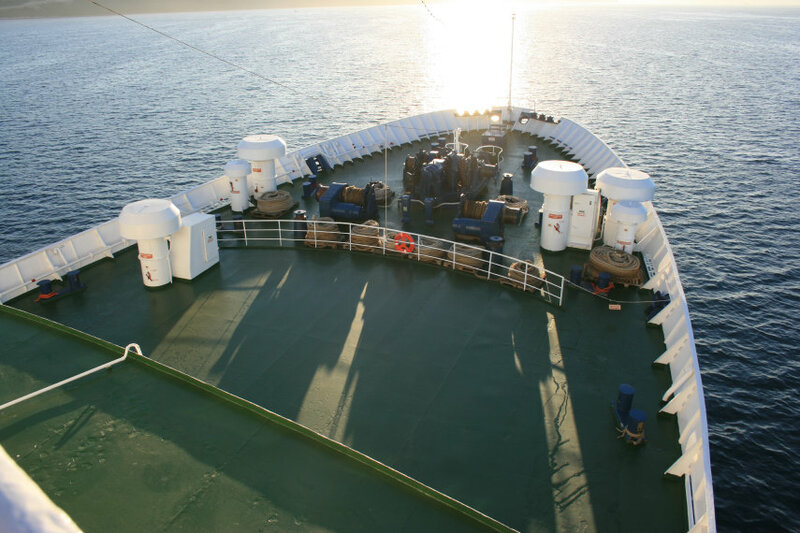 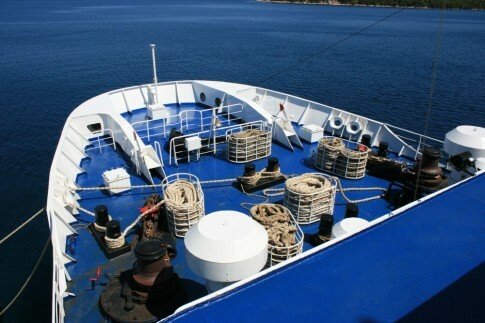 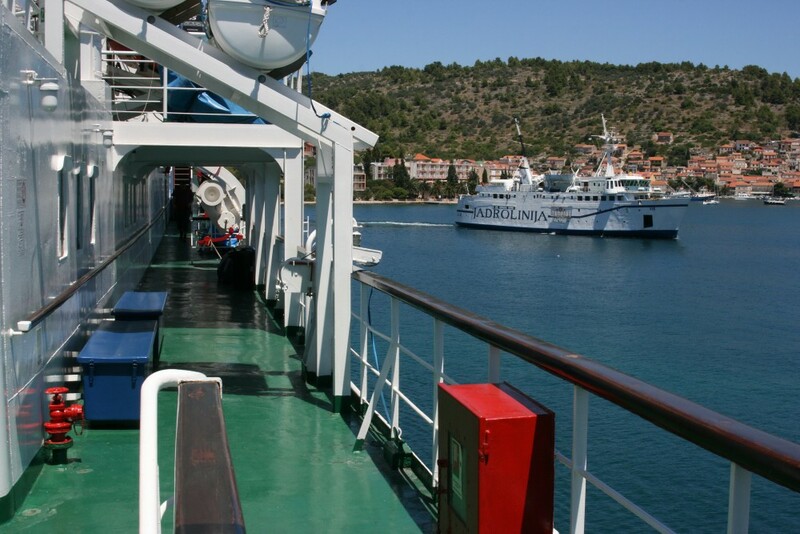 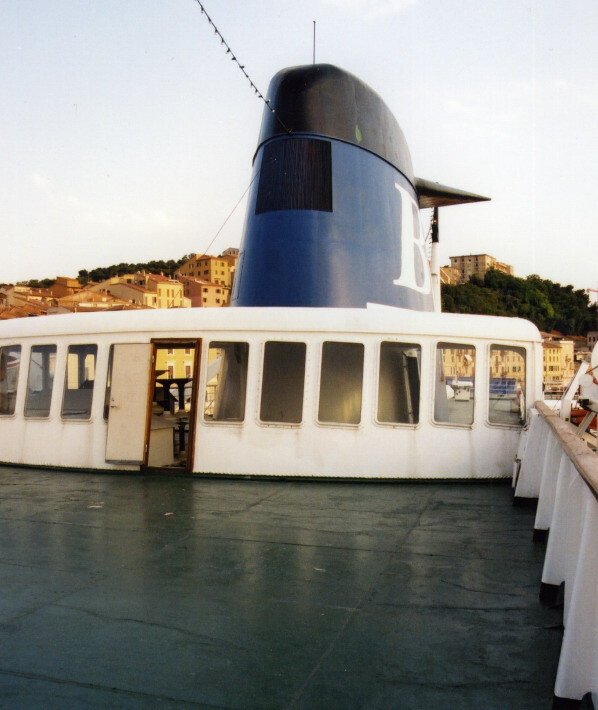 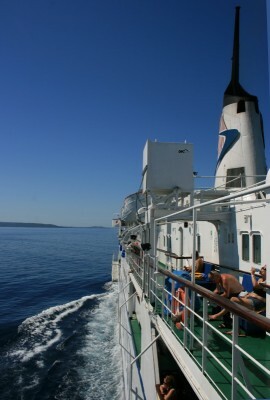 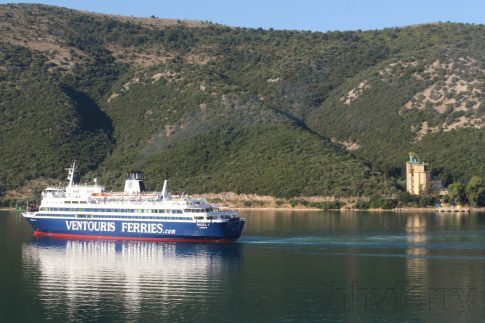 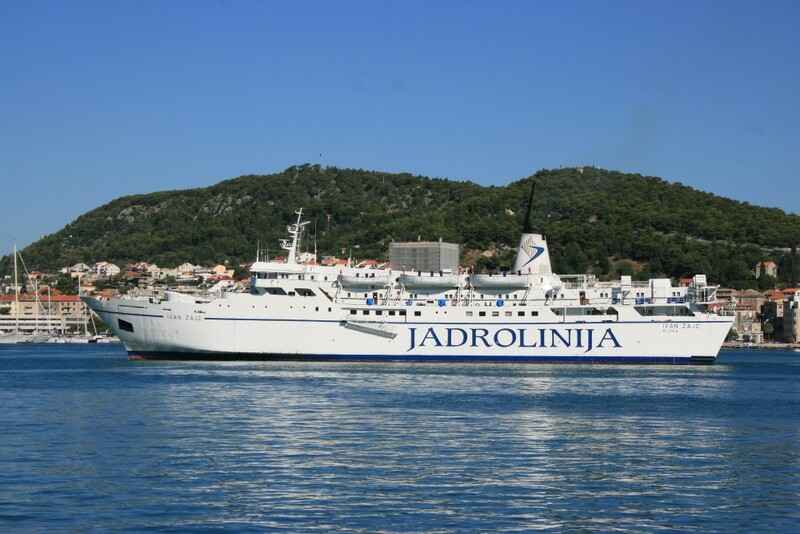 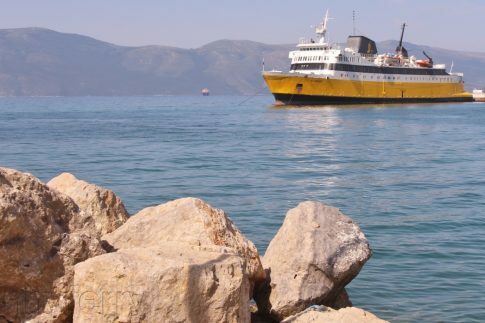 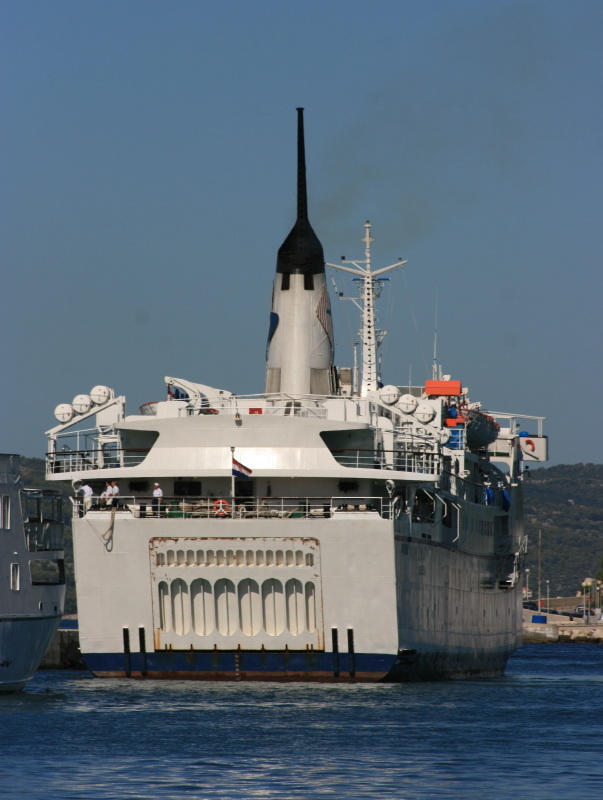 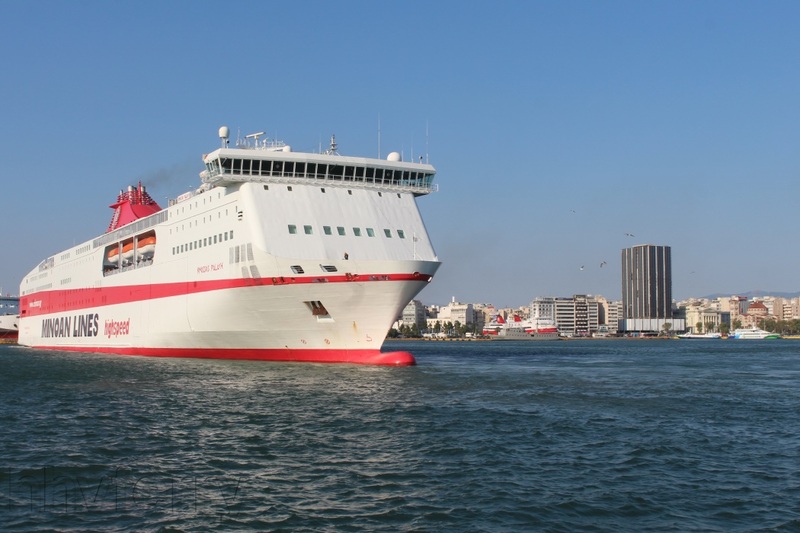 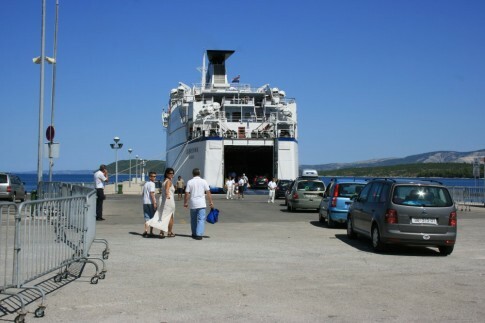 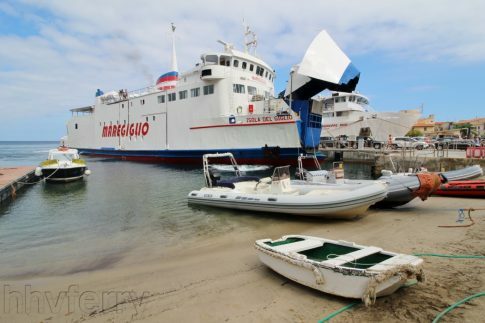 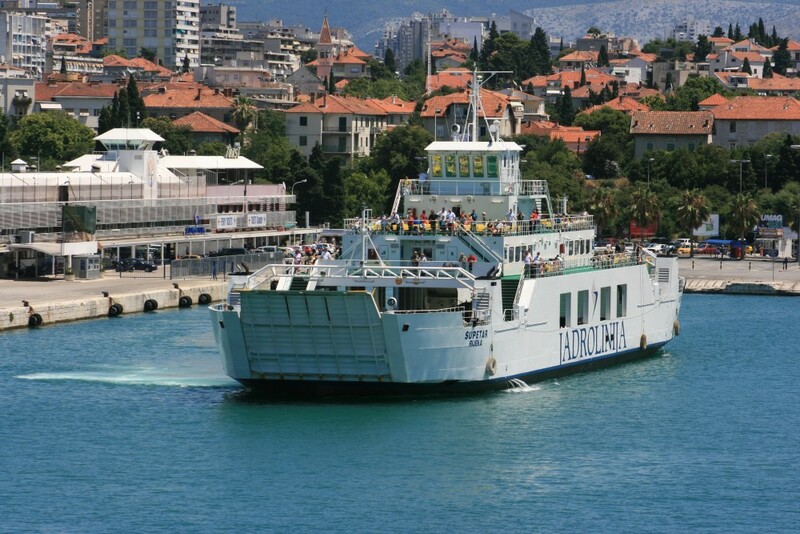 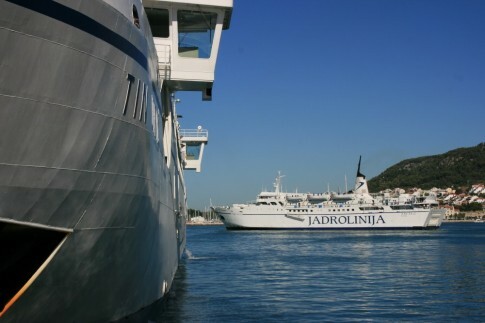 In 2007 Jadrolinija introduced some Pescara-Split sailings, restoring the ship to her original route. 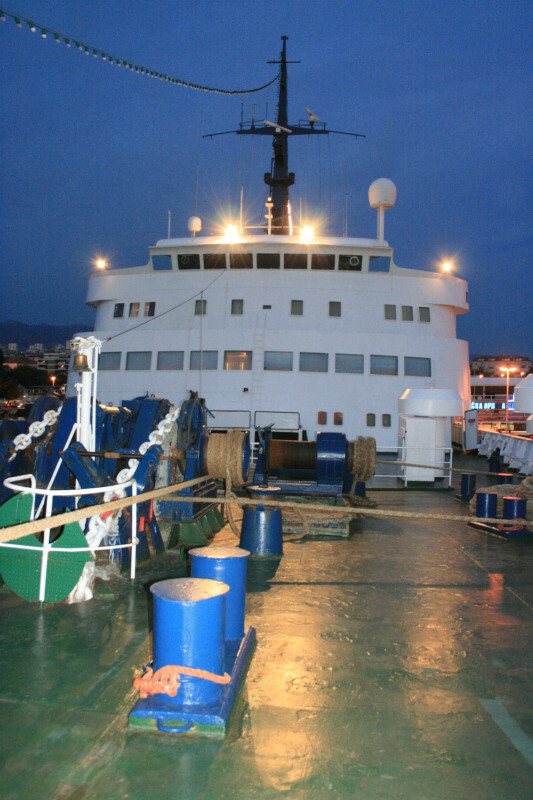 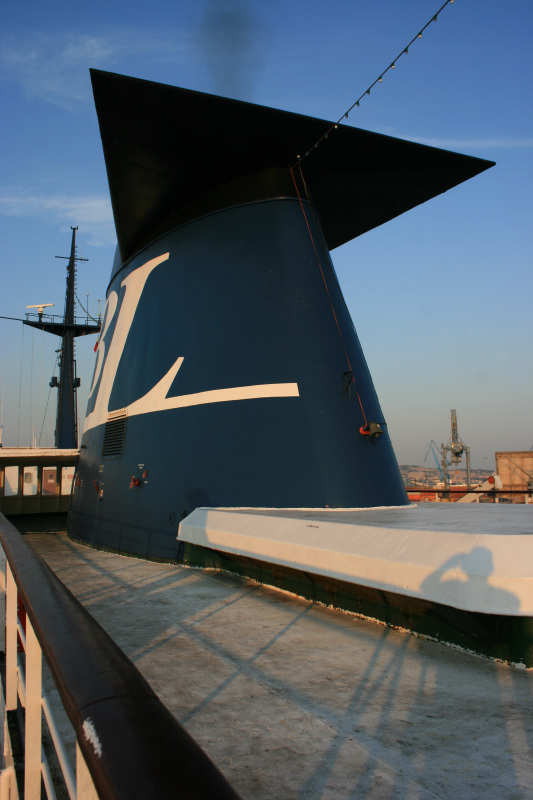 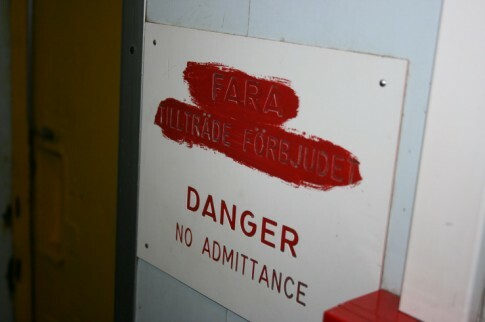 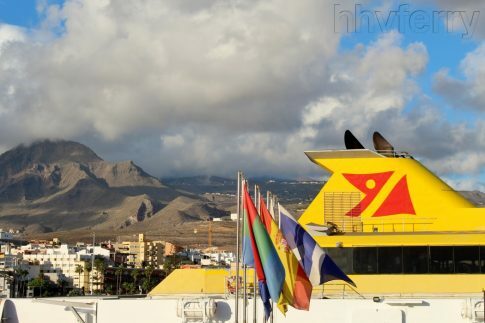 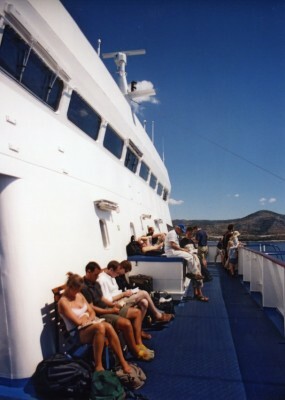 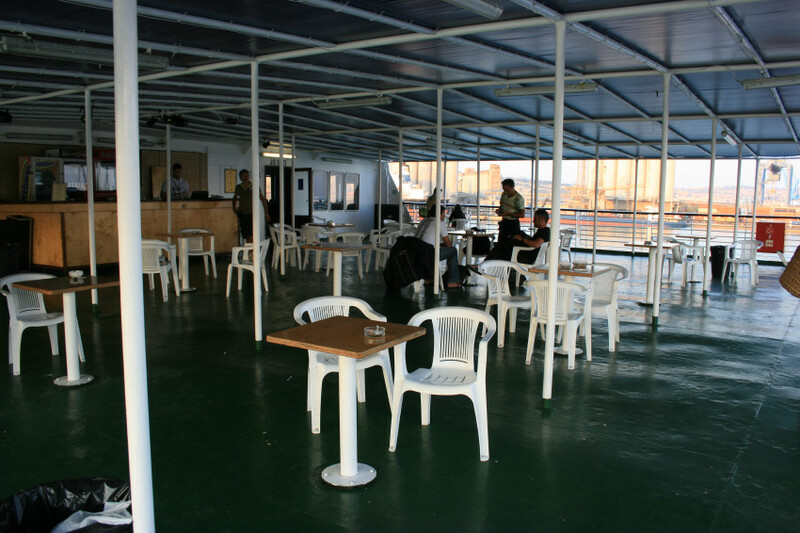 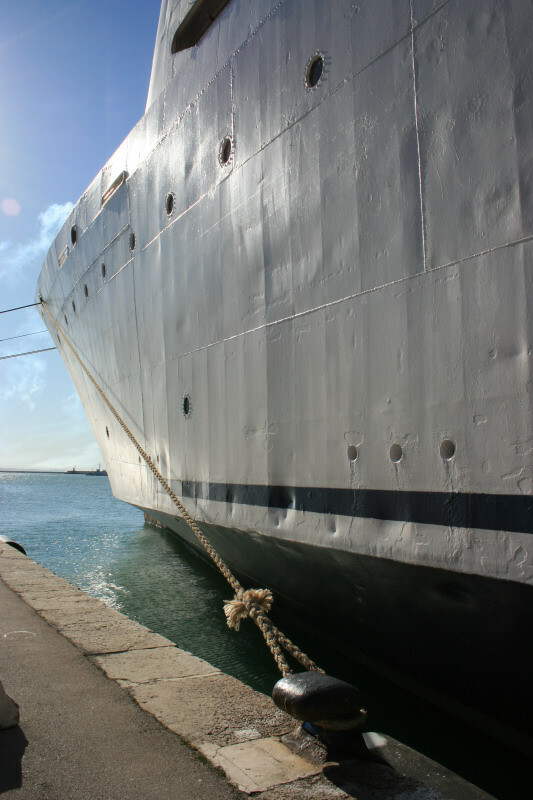 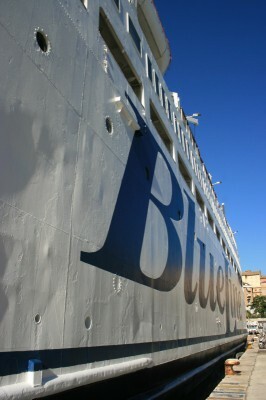 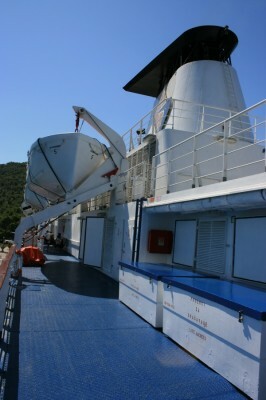 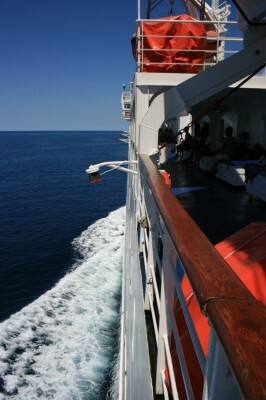 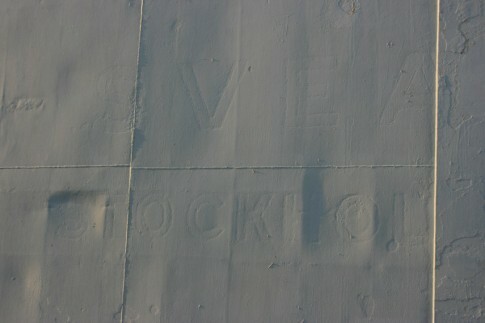 The starboard side outside deck upon arrival at Vela Luca in 2007. 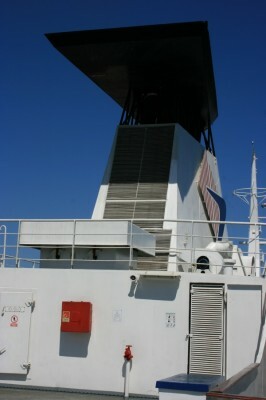 In the background is the Vis (ex-Sydfyn). 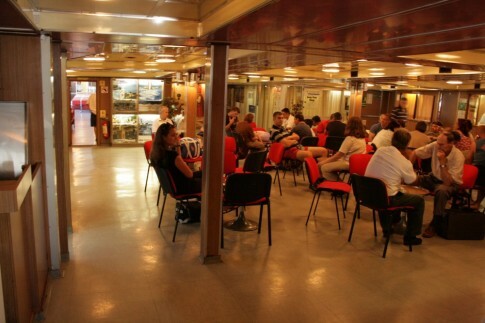 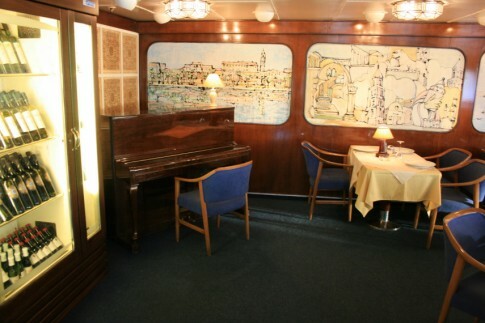 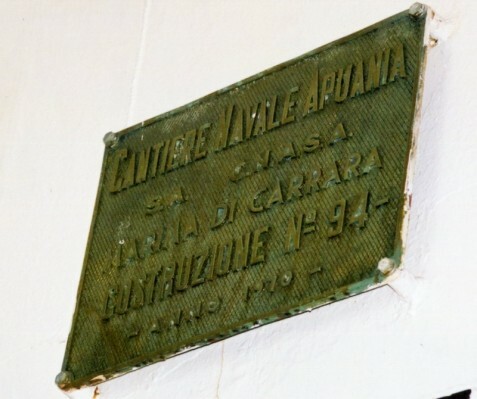 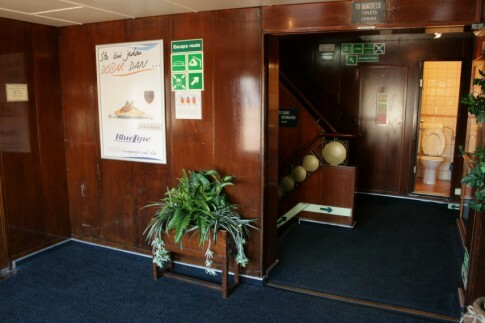 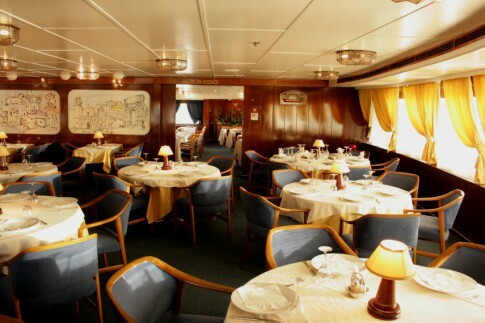 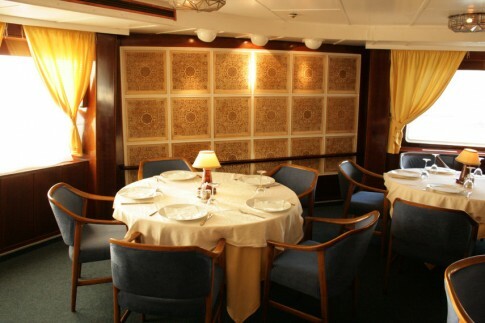 The shipâ€™s interiors are certainly distinctively Italianate, and largely unchanged under Jadrolinija. 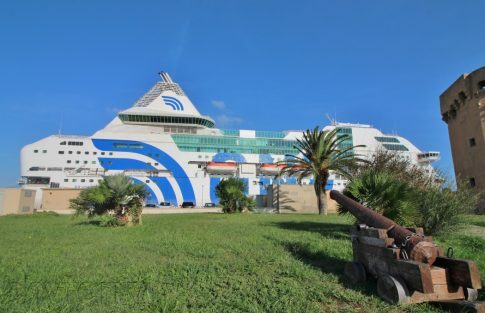 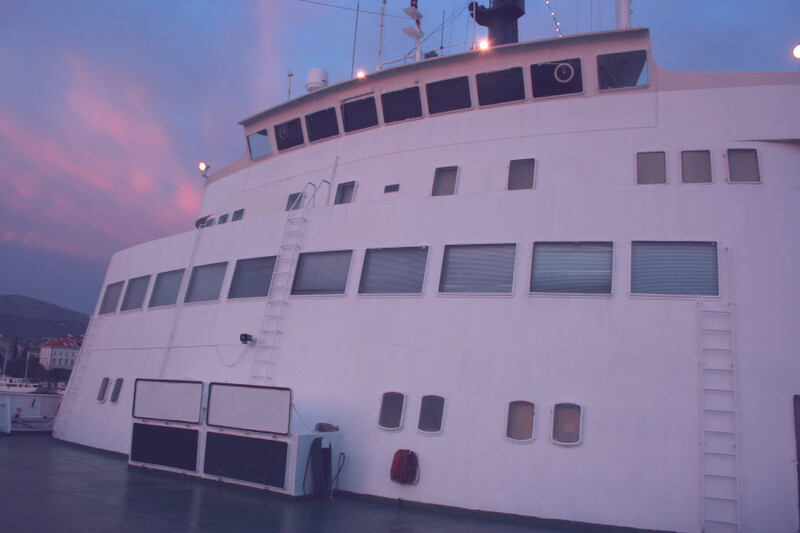 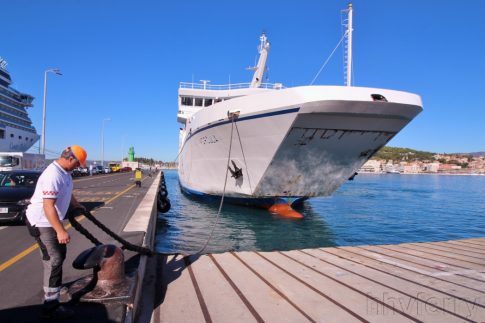 She feels deceptively small and cramped and is perhaps best as an overnight ship, although at least on sunny day sailings passengers can spill out onto the open decks. 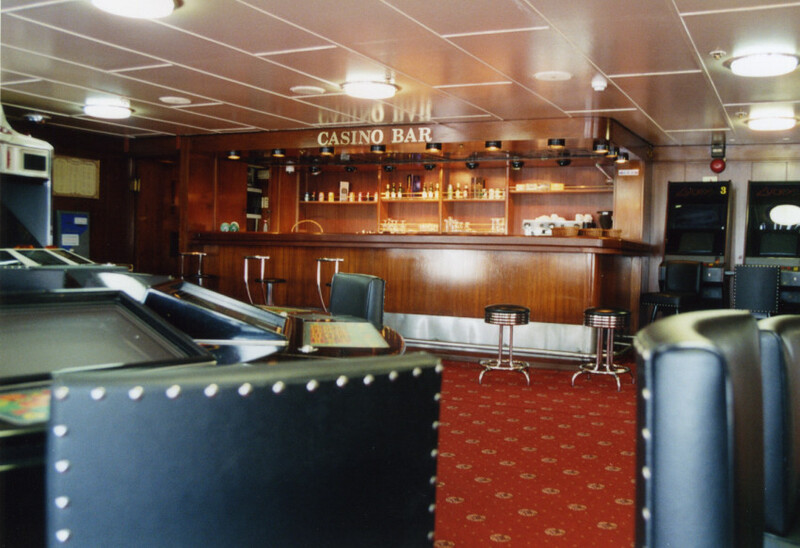 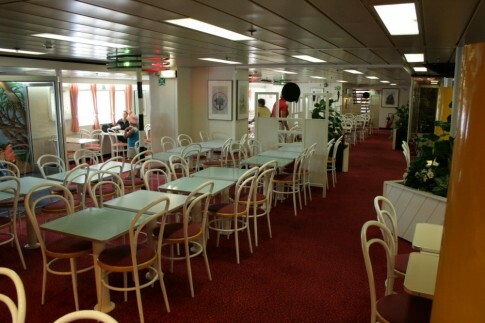 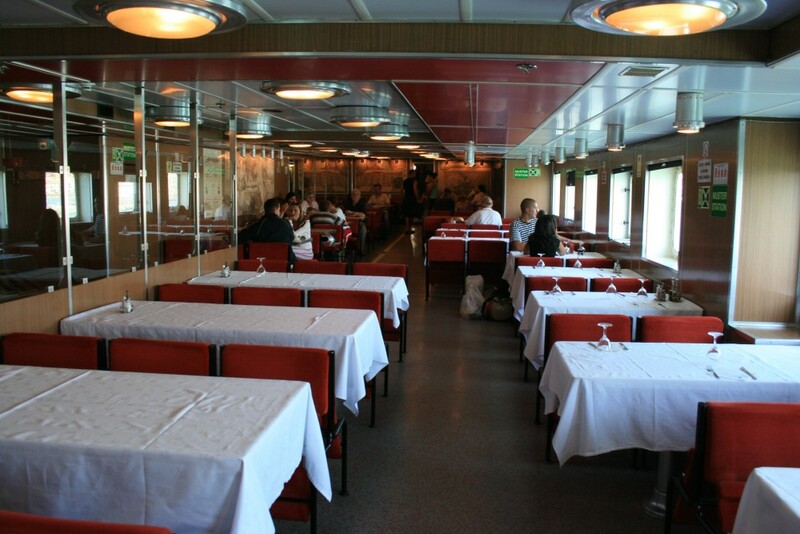 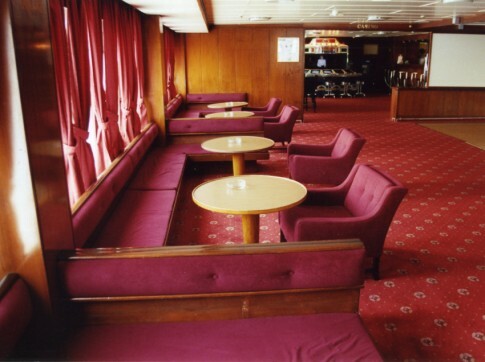 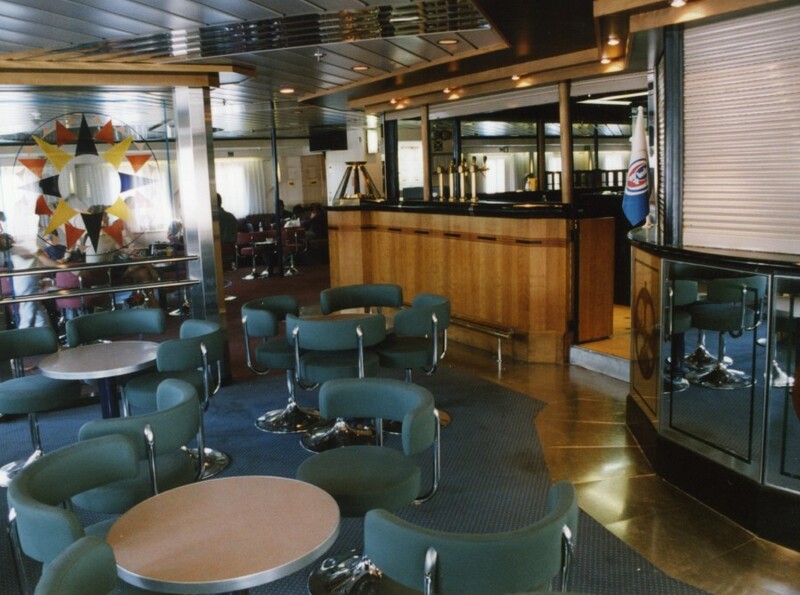 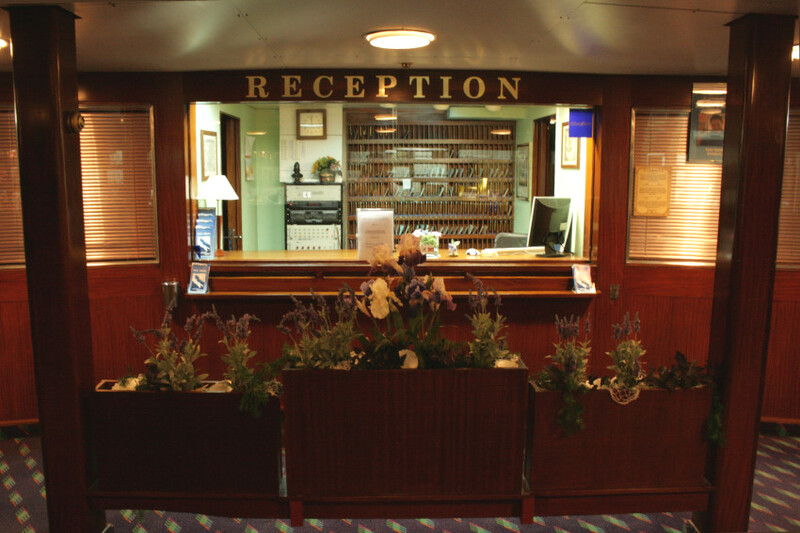 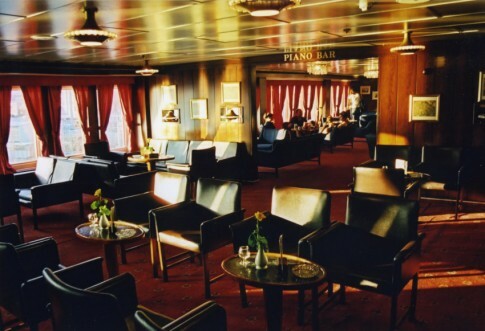 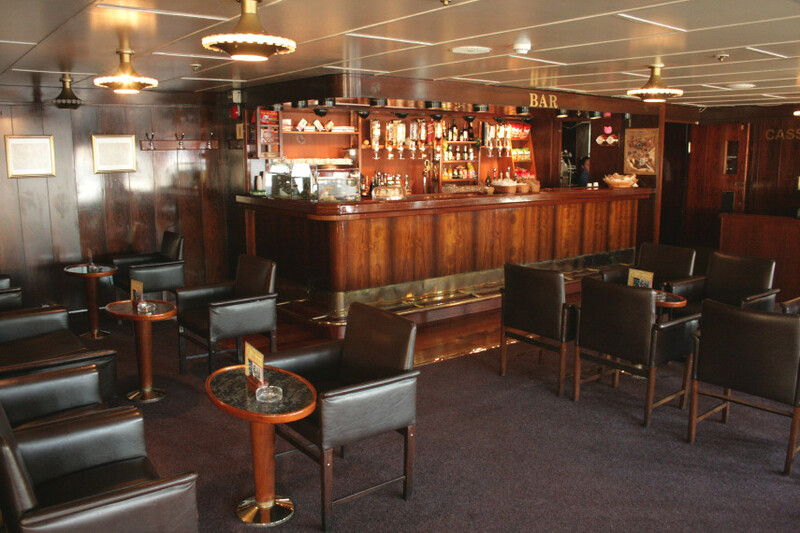 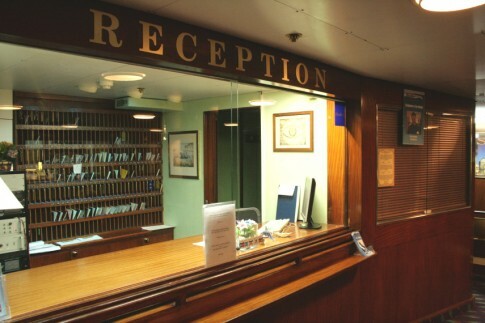 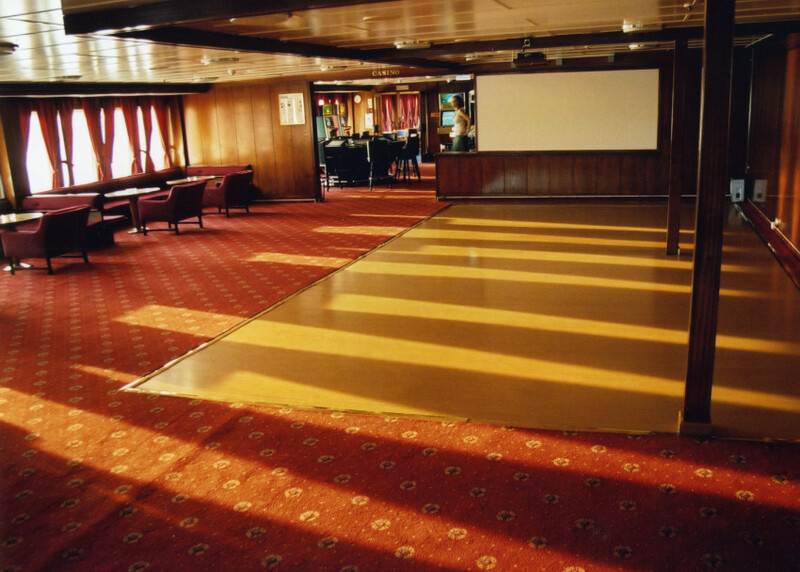 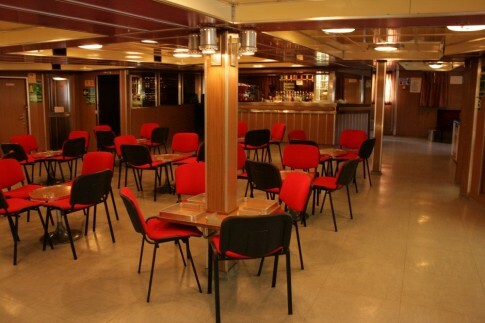 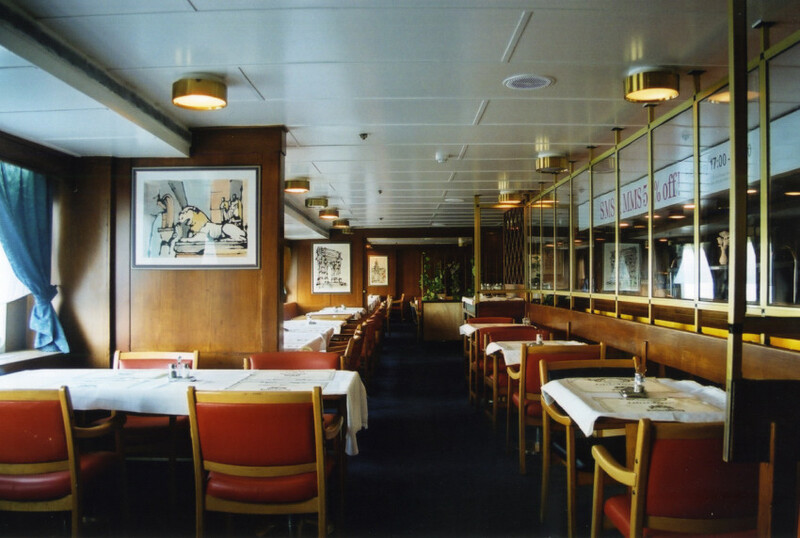 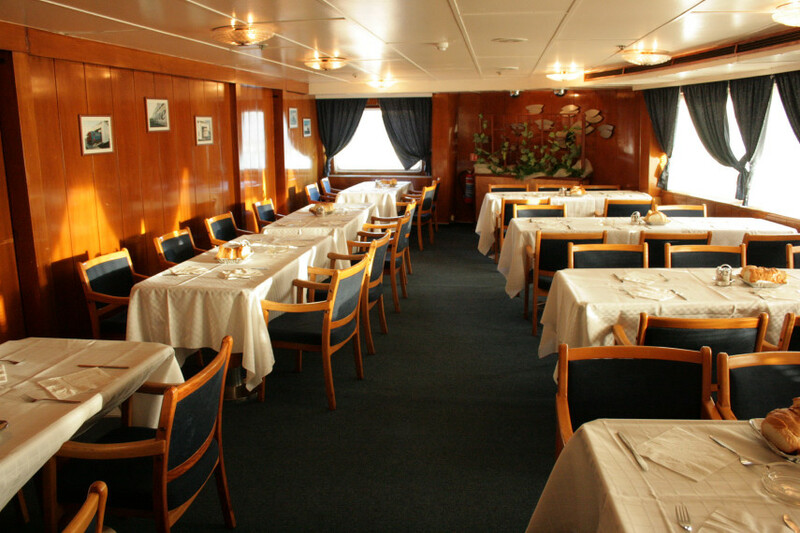 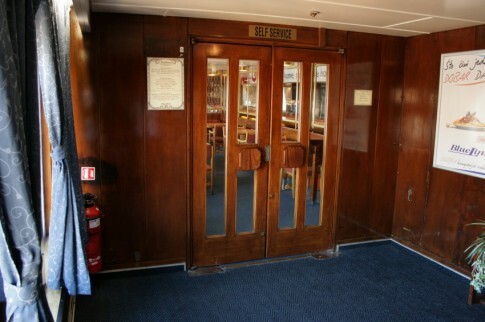 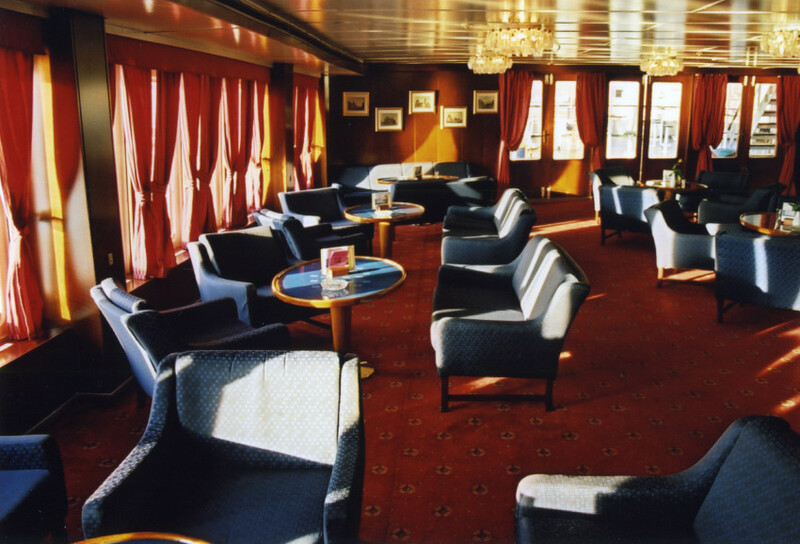 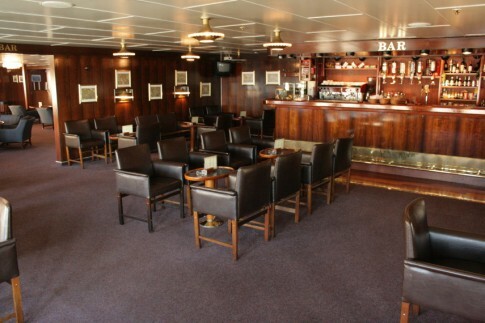 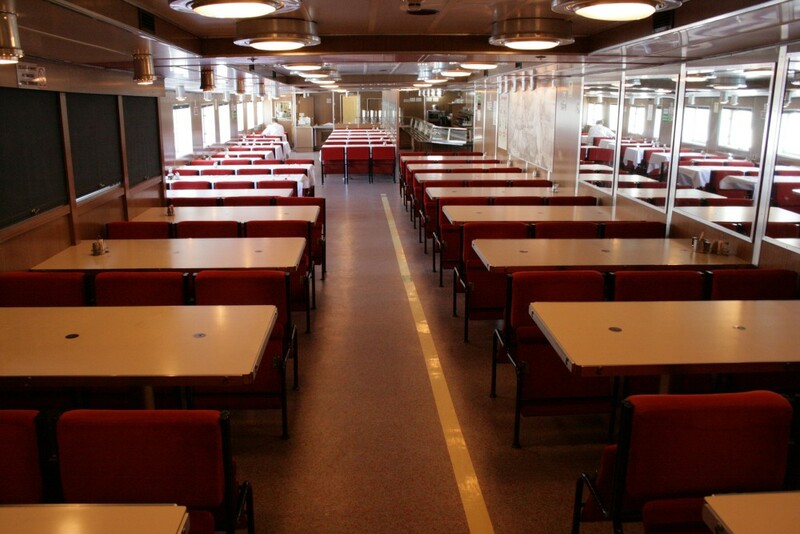 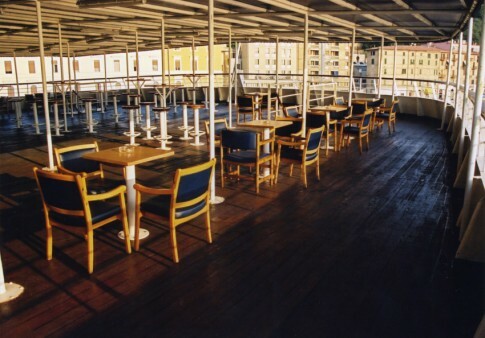 The public rooms consist of a curious windowless bar area forward complete with Purserâ€™s desk and, adjacent on the starboard side, a restaurant area. 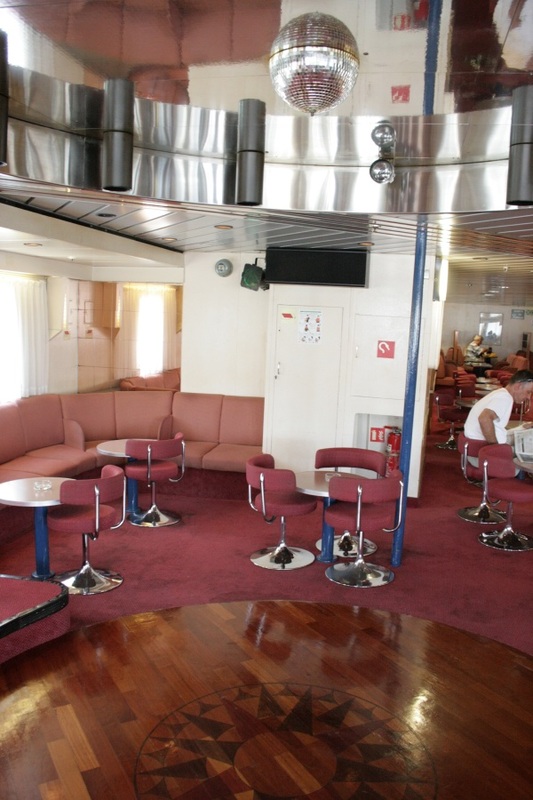 Other than that, this ship is a rabbit warren of narrow cabin alleyways, with a couple of reclining seat lounges off to port. 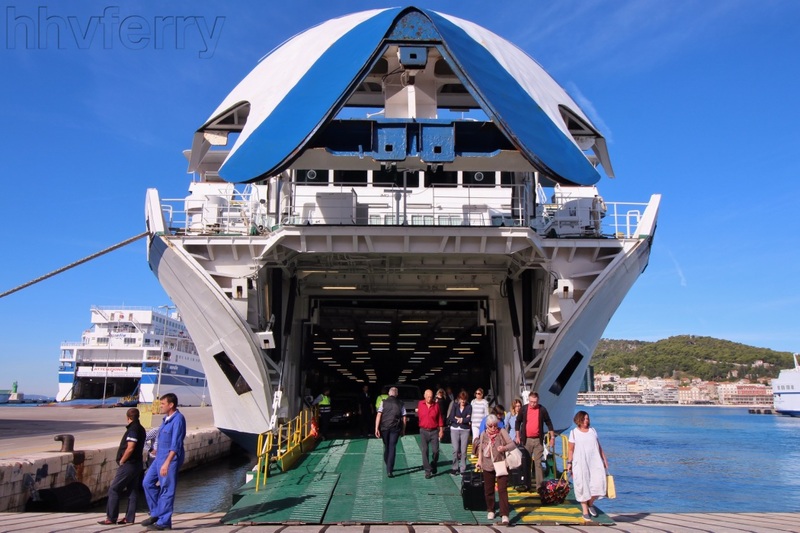 Charming in its own way but, on a busy crossing and particularly upon boarding and arrival, full of bottlenecks with crowds of people trying to push past each other. 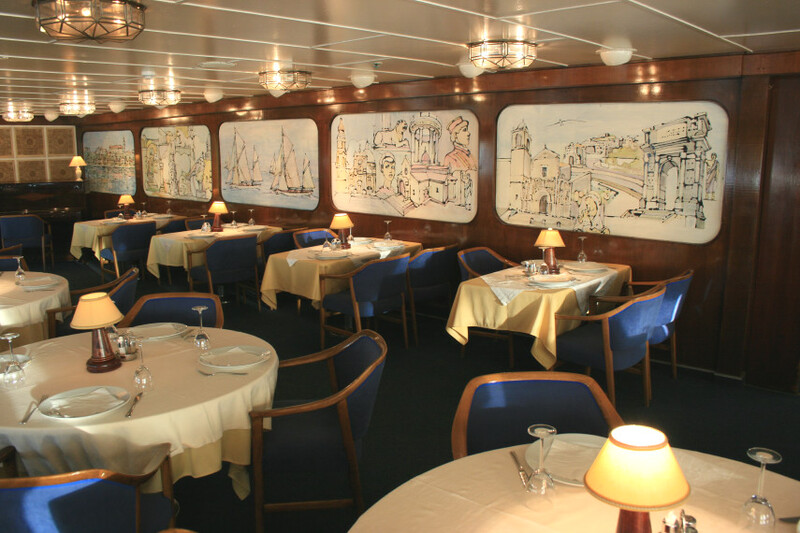 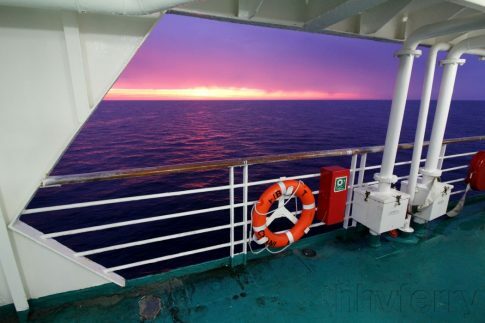 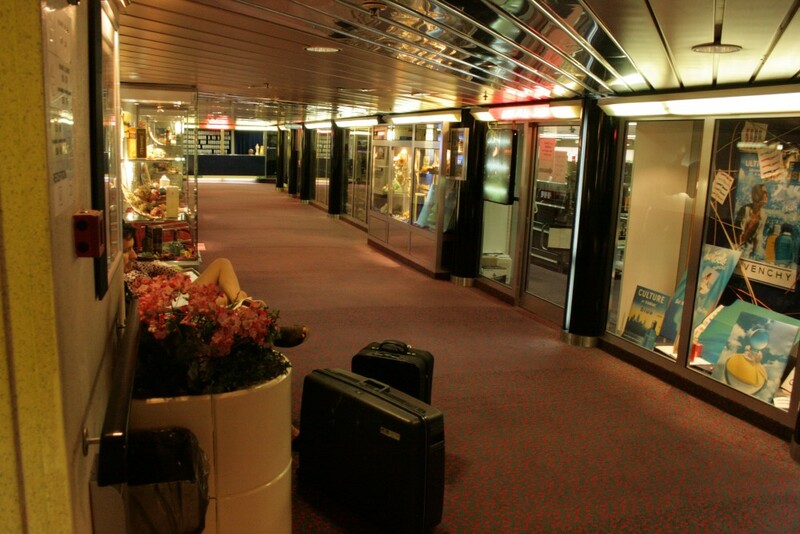 Scattered around the ship are a series of large, framed Italian art prints. 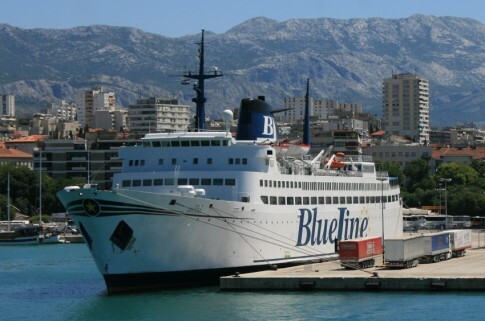 The Tin Ujevic on her berth at Split, with the Ivan Zajc departing. 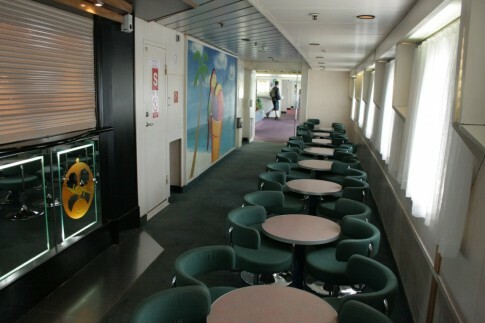 The windowless bar, forward, looking aft on the starboard side. 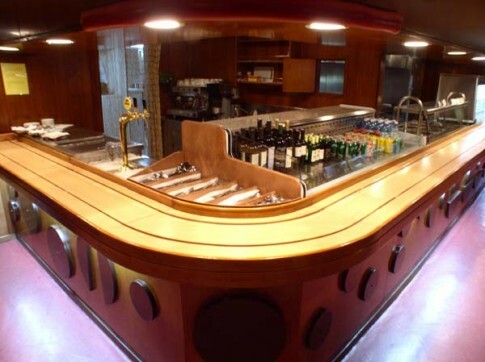 Another view of the bar. 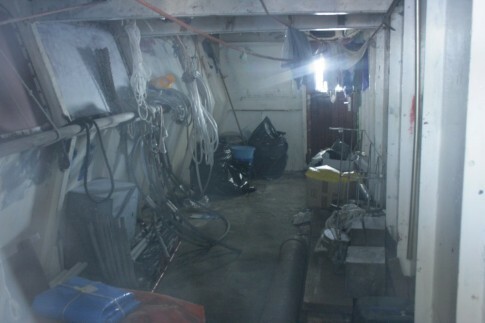 The purser's office and a small shop are also located here. 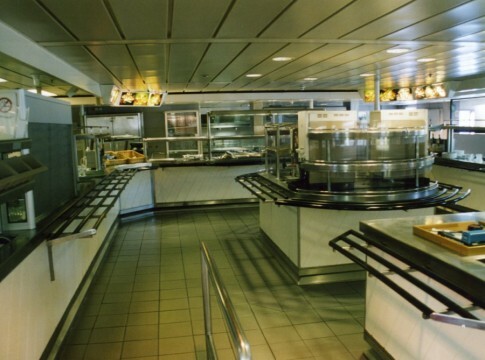 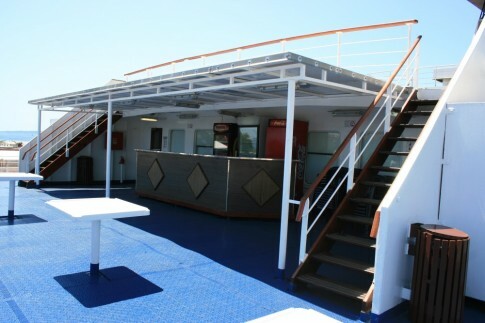 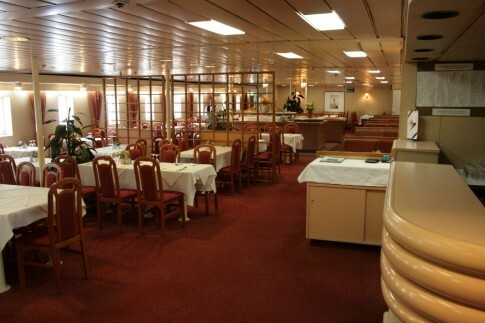 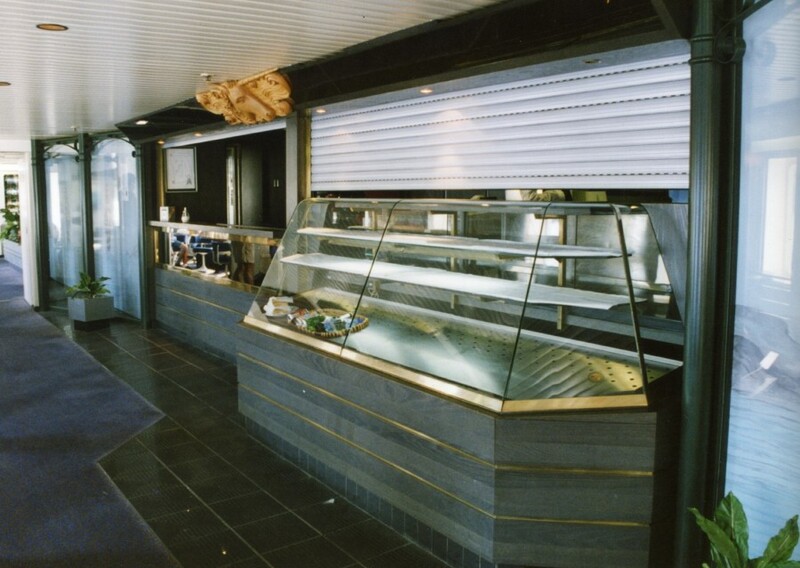 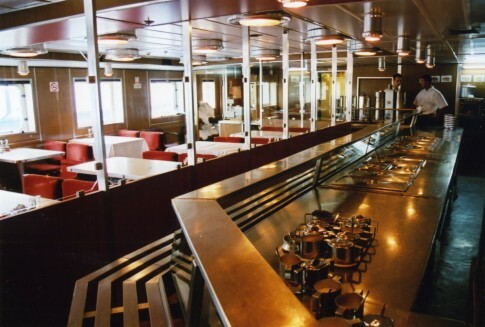 The self service restaurant, aft of the bar on the starboard side. 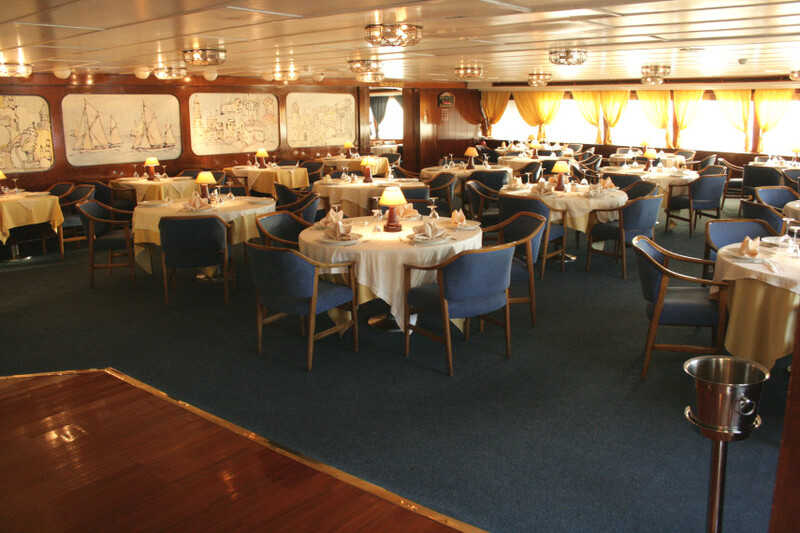 Right aft, an area is partitioned off for waiter-service. 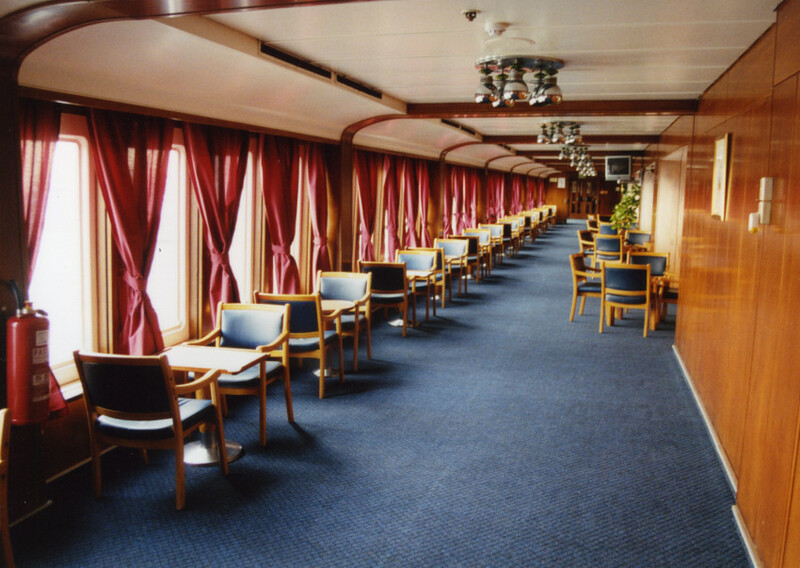 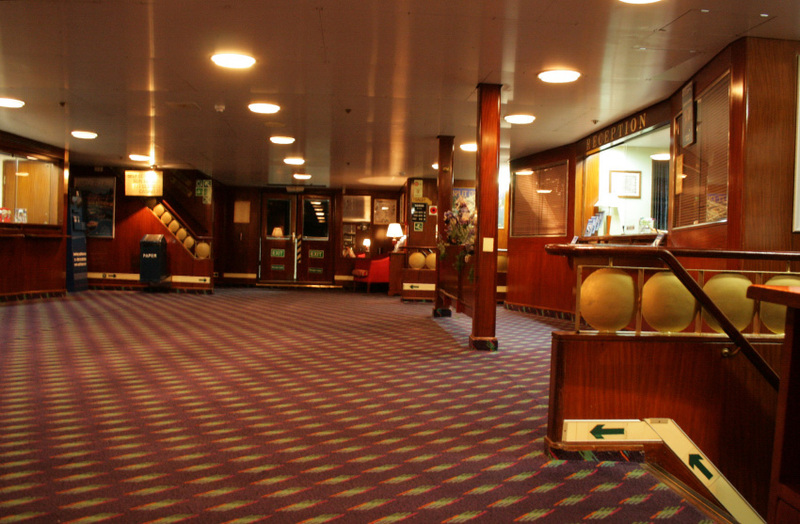 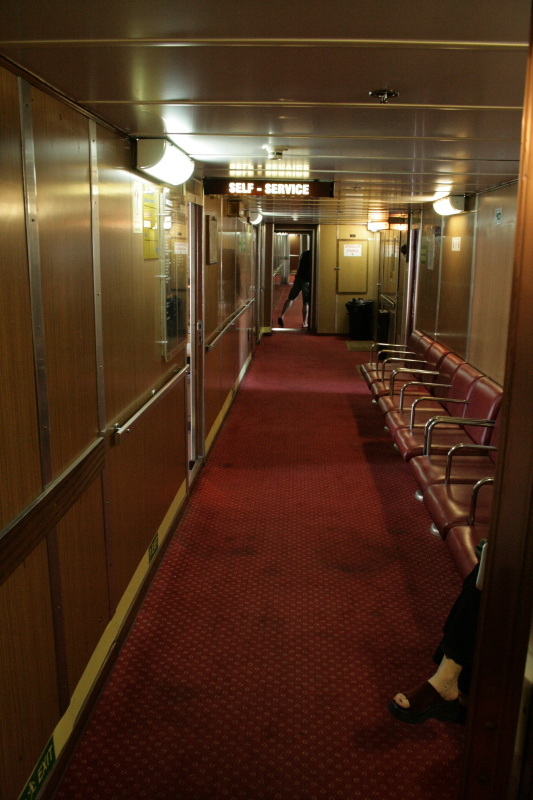 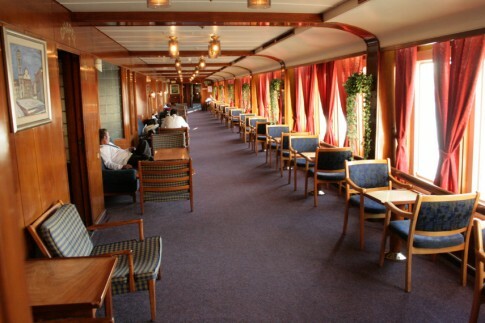 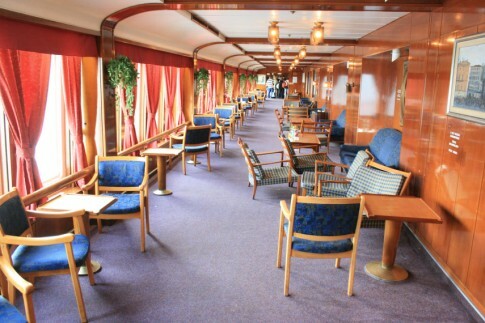 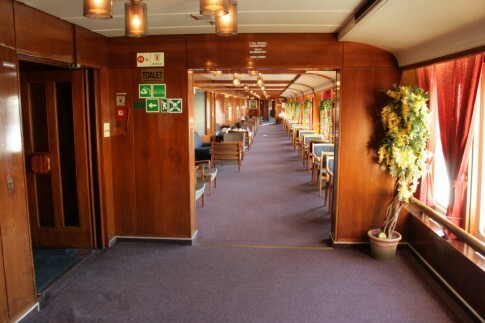 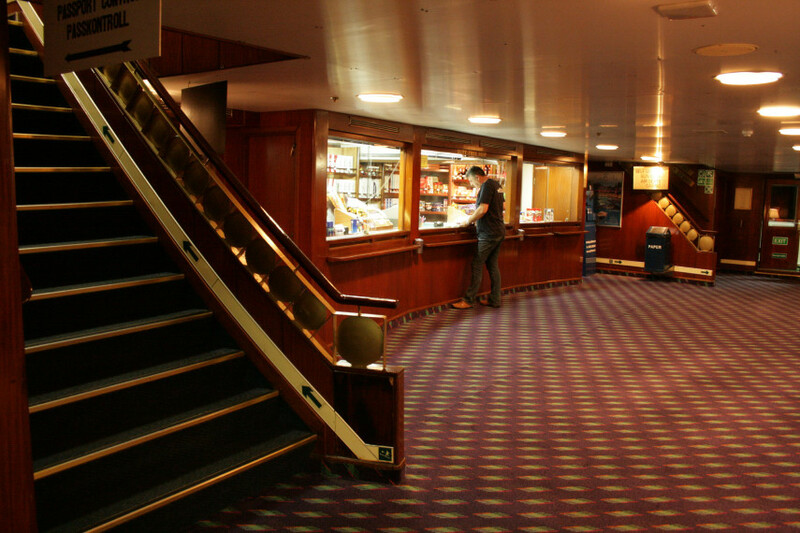 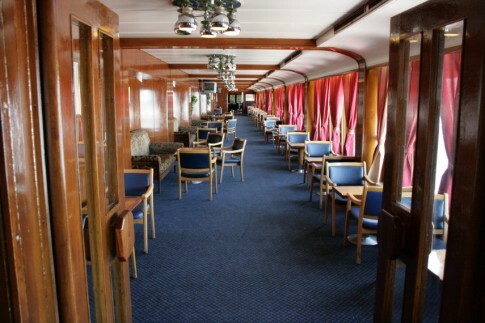 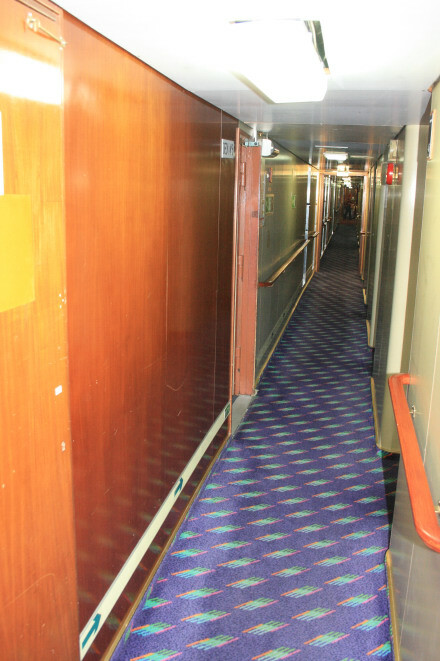 The centreline corridor leading aft from the bar with the self-service to the right and recliner lounge to the left. 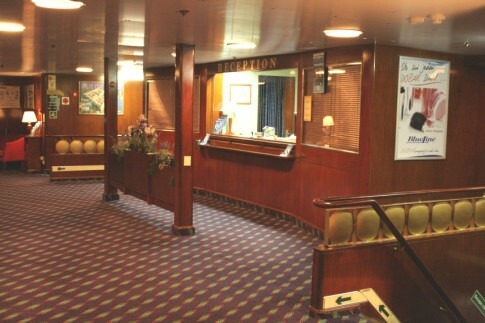 The upper lobby, complete with four large Italian art prints. 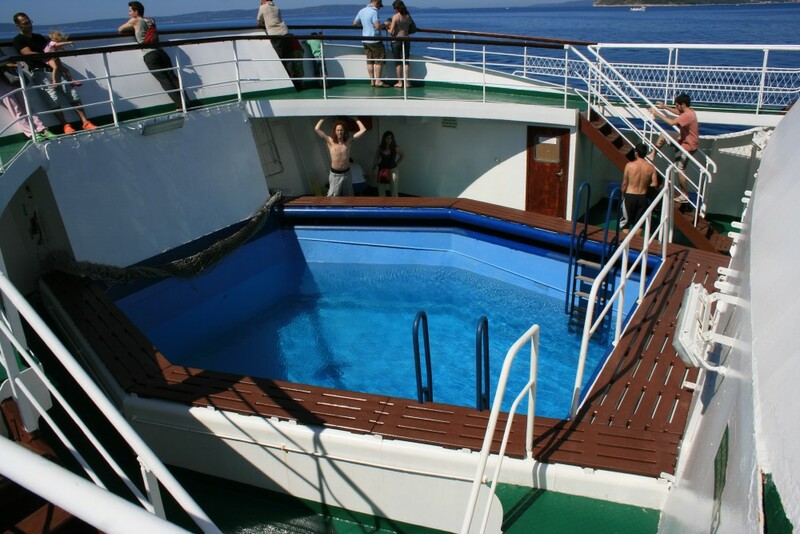 Shoehorned onto the forecastle is a small swimming pool, empty on our night crossing and it was just aft of this, on the port-side promenade that we set up camp for the night on one of the lifejacket containers. Nabbing a decent place to sleep on the outside decks had been our first priority upon boarding: exploring the ship could wait for later although, as can be seen, there really isnâ€™t much to explore. The Ivan Zajc pulled out of Split on time and after a long day we bedded down for the night and I soon nodded off to sleep. I was awoken abruptly in the middle of the night to find a female face leering above screeching in an Australian accent. â€œYouâ€™ve stolen my shoes! 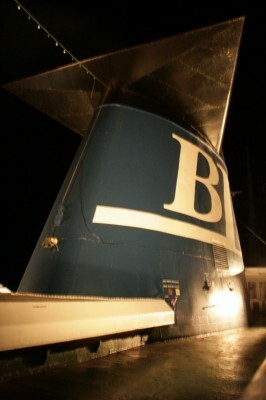 My shoes! 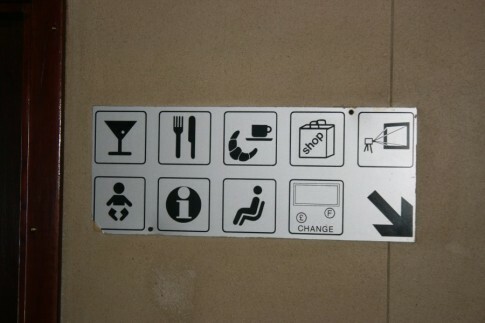 Where are my shoes?! 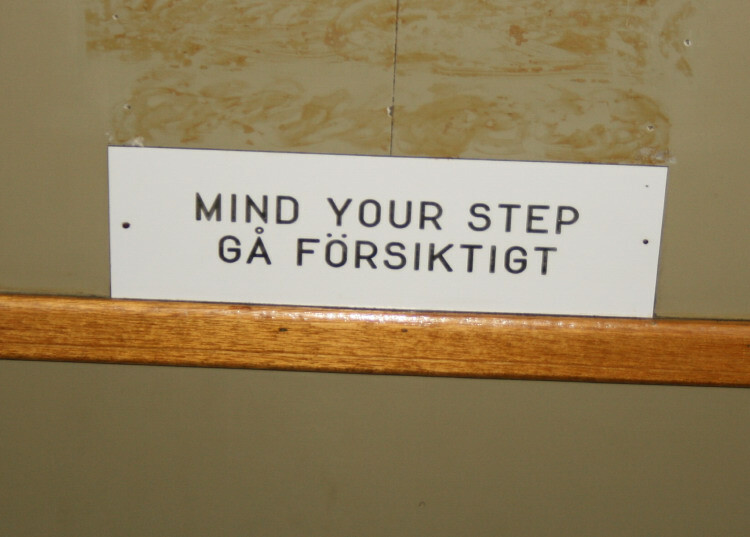 Iâ€™m going to have to walk around Europe with no shoes!â€. 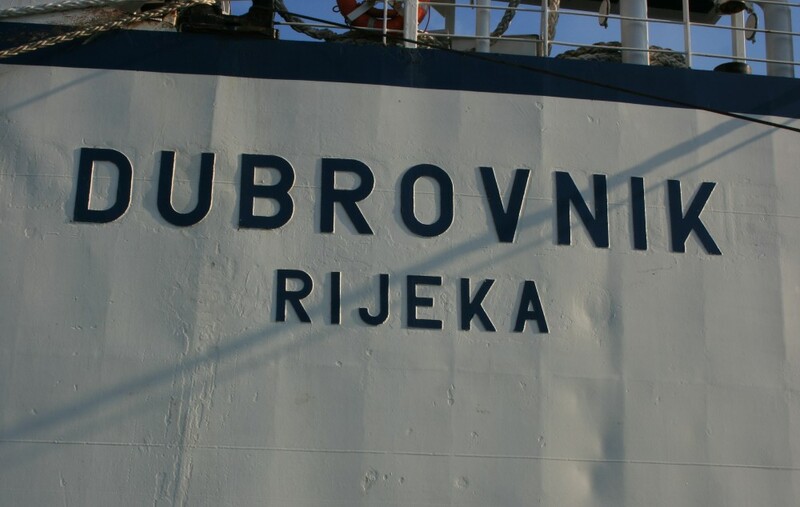 My first reaction was to zip my sleeping bag up over my head perhaps, in my half-comatose state, thinking that this was merely an unfortunate hallucinogenic reaction to the slightly tough and overcooked steak Iâ€™d had for lunch on the Liburnija. But, alas, no: this was all too real. 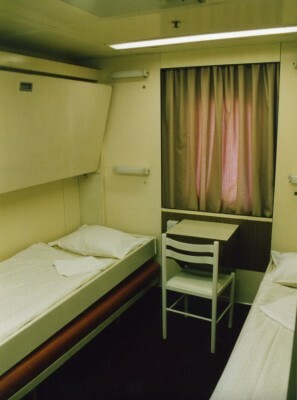 This was altogether too bizarre a situation to comprehend in the middle of the night but in retrospect I should perhaps have advised her that if, by some good fortune, Daddy had left me in control of his credit card, I probably would have found better ways of spending money than travelling deck class on the Ivan Zajc, trying to sleep whilst lying on a hard plastic lifejacket container. 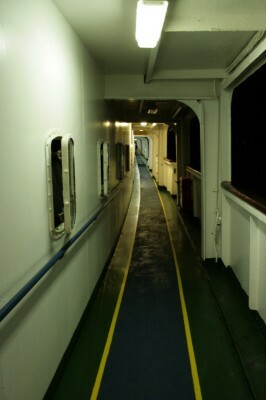 Alas the opportunity was lost as our Aussie friend was soon led away by a concerned travelling companion and I resumed my slumber, slightly nonplussed. We awoke the next day as the ship neared Ancona; the rival Split 1700 had sailed in convoy with us overnight and had arrived just before. 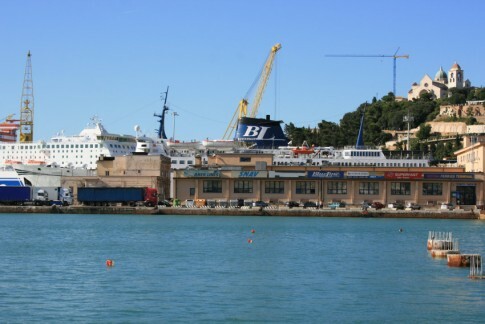 With the early morning arrival we headed off to rouse ourselves with some coffee, cake and freshly-squeezed orange juice in a little cafÃ© in the town, which has become something of a regular haunt after early morning Ancona arrivals. 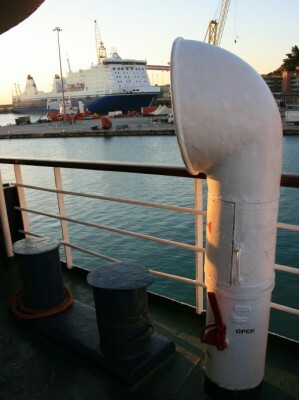 Suitably resuscitated we headed off towards the main railway station where a Eurostar Intercity train would speed us down the coast to Bari. 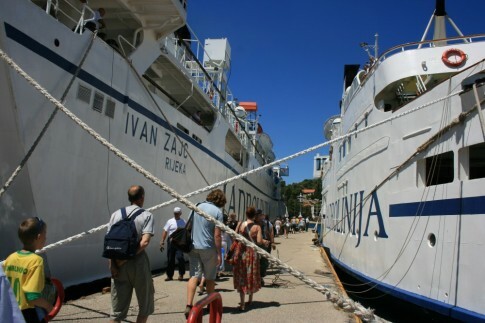 Looking forward on the Ivan Zajc. 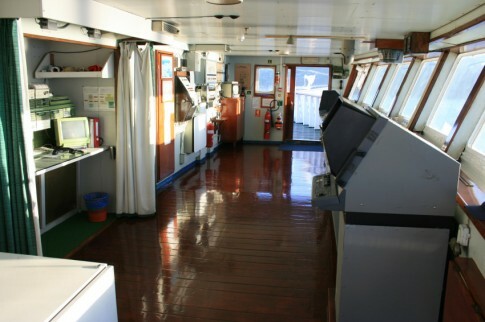 Right aft, the ship was built with a stern bridge. 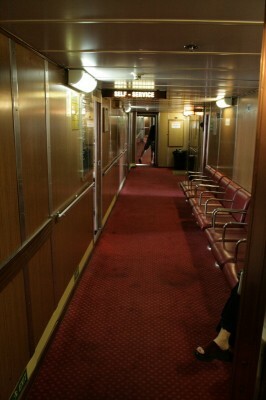 Today it is abandoned. 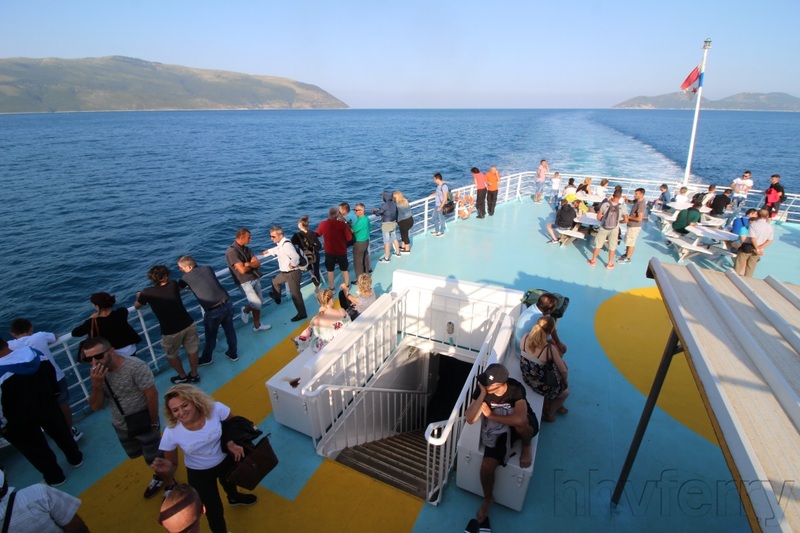 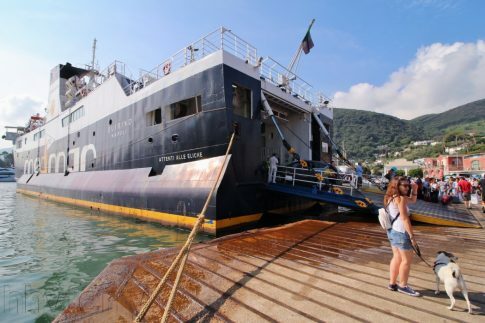 Since the sale of the Ivan Zajc earlier in the year, the Dubrovnik (ex-Duchesse Anne, Connacht) of Croatia’s state ferry company Jadrolinija is now rostered to sail on Split-Ancona sailings alone this Summer. 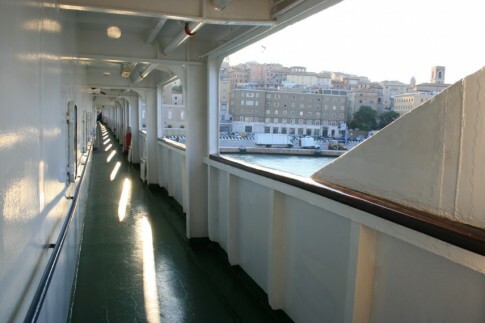 Repeating her pattern of the past couple of years, the ship makes four round trips a week, all overnight save for a daylight crossing from Ancona on Sundays. 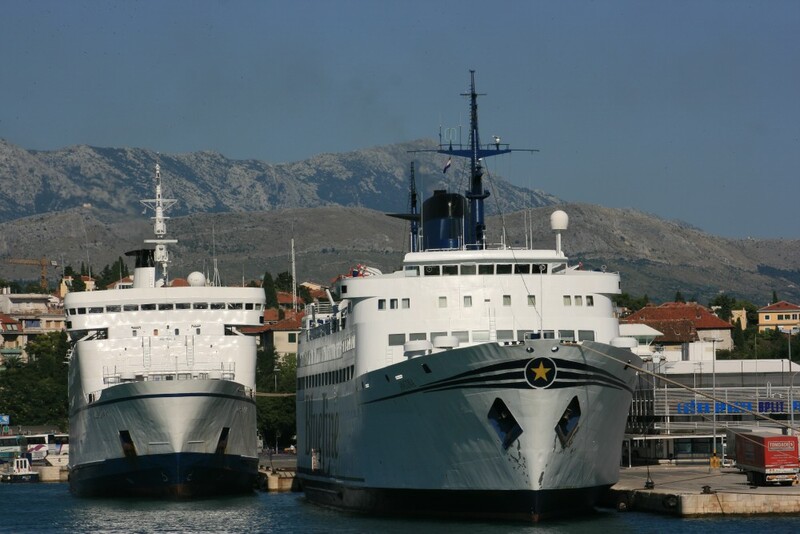 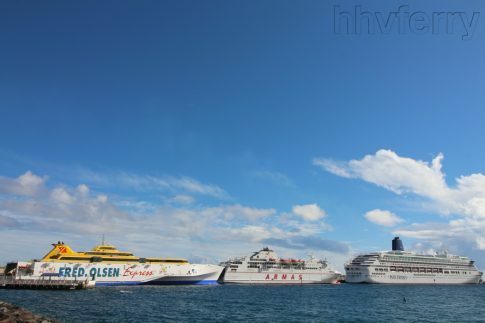 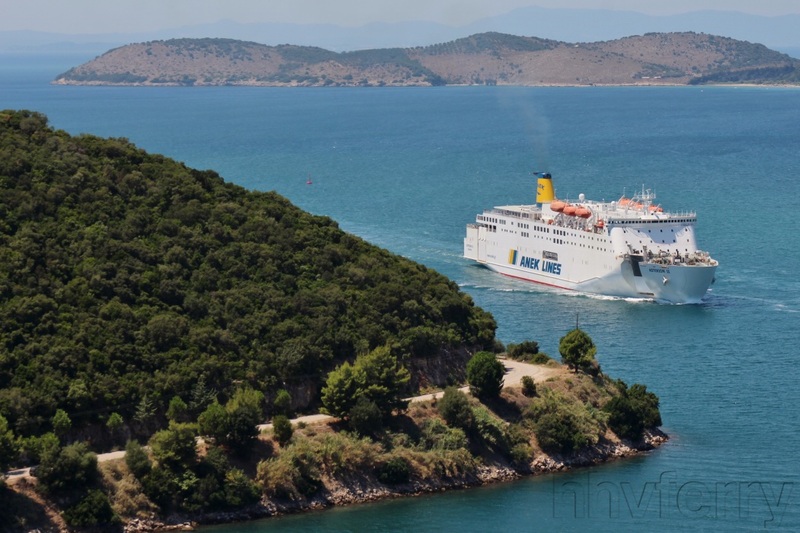 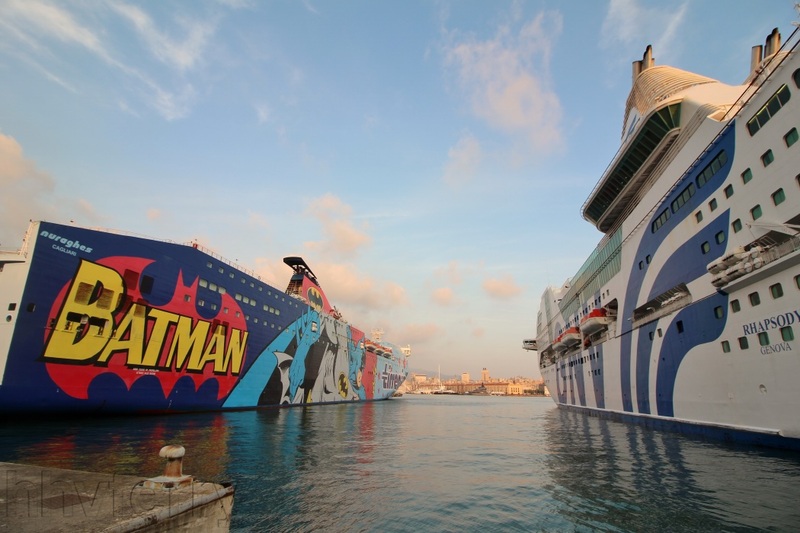 In addition, on overnight sailings ex-Italy the ship carries on after arrival in Split to do a domestic round trip to Stari Grad on the island of Hvar; with customs formalities completed in Split, this can be booked as a through sailing from Ancona, or as a normal domestic sailing. With the retrenchment of the coastal Rijeka-Split-Stari Grad-Korcula-Dubrovnik-(Bari) services in recent years, the current roster is comparatively straightforward; in 2003 for example, a breathless Summer timetable saw the ship each week make one of the complete 26 hour hauls from Rijeka through to Bari, then back again, followed by Rijeka-Split-Stari Grad-Korcula, Korcula-Stari Grad, Stari Grad-Split-Ancona and back, and finally Stari Grad-Split-Rijeka to begin it all again. 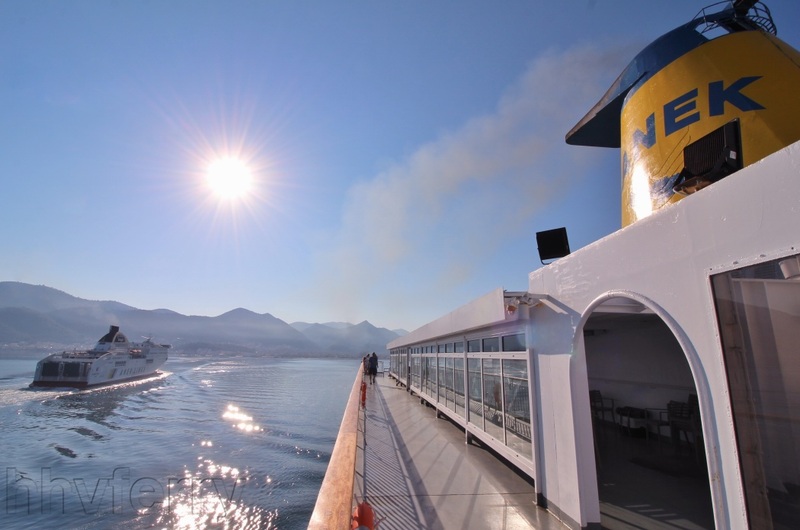 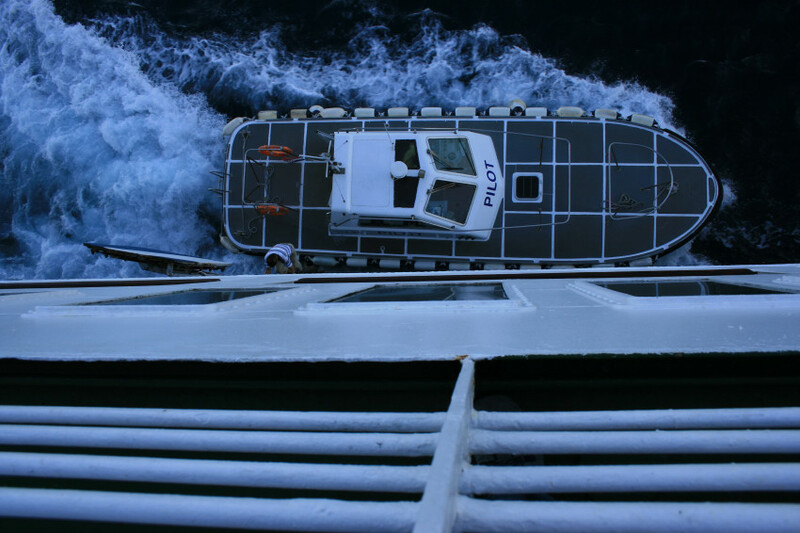 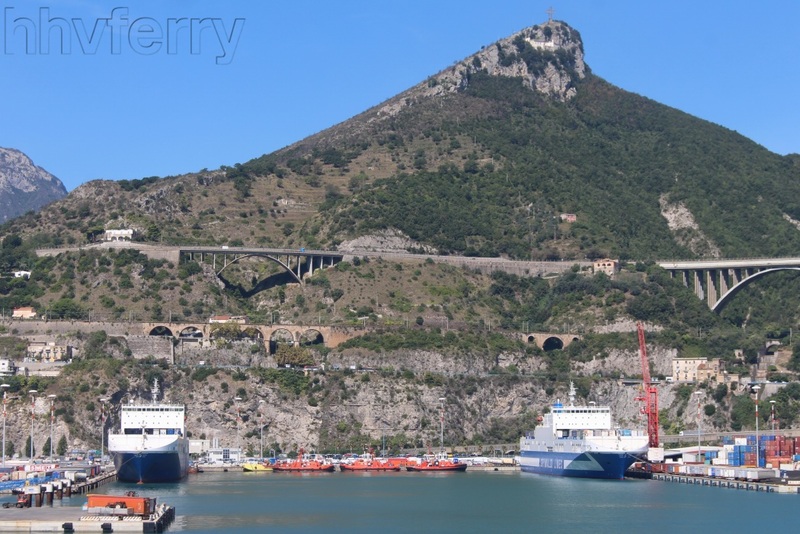 Today, life is rather more simple and the ship has plenty of time in between sailings, particularly Mondays, Wednesdays and Fridays when she sits in Ancona from her early morning arrival until a 2100 departure. Delivered by Cork’s Verolme Shipyard as the Connacht to B&I Line in 1979, the ship initially served Cork, briefly from Swansea and then on the new Pembroke Dock service. 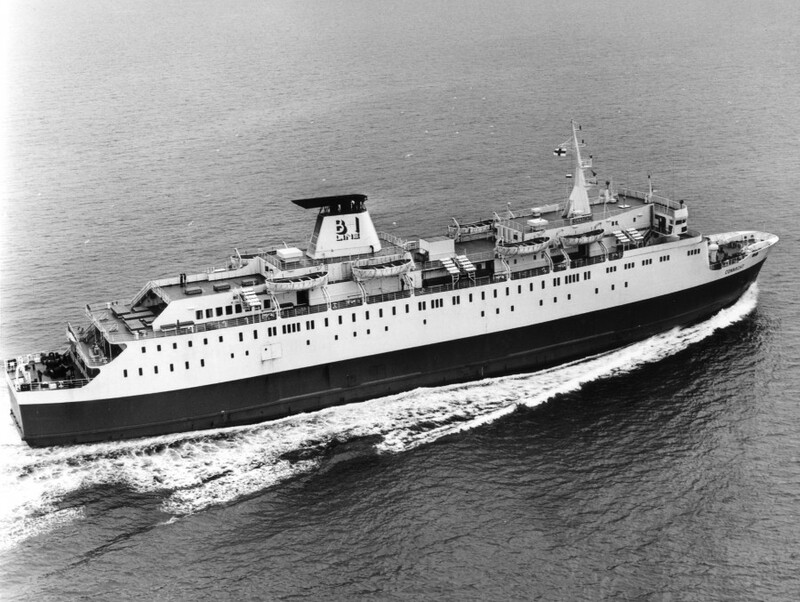 She was was transferred to the Dublin-Liverpool service in September 1980, where she was joined by sister Leinster in July 1981. Loss-making B&I sought improved utlisation of the new ships and a daily Dublin-Holyhead round trip in between the overnight sailings from and to Liverpool was subsequently added. 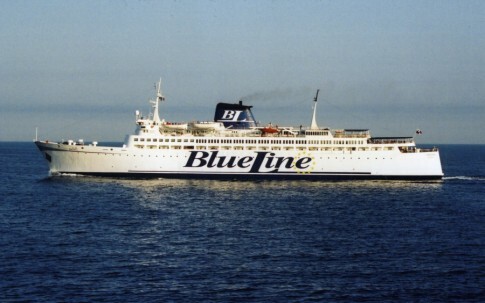 These began, after no little controversy over the use of the Sealink port, in Spring 1982 and the Connacht eventually closed the Liverpool link altogether in January 1988, leaving Dublin services in the hands of the Leinster alone, being transferred back to Pembroke (the Irish port now being Rosslare). 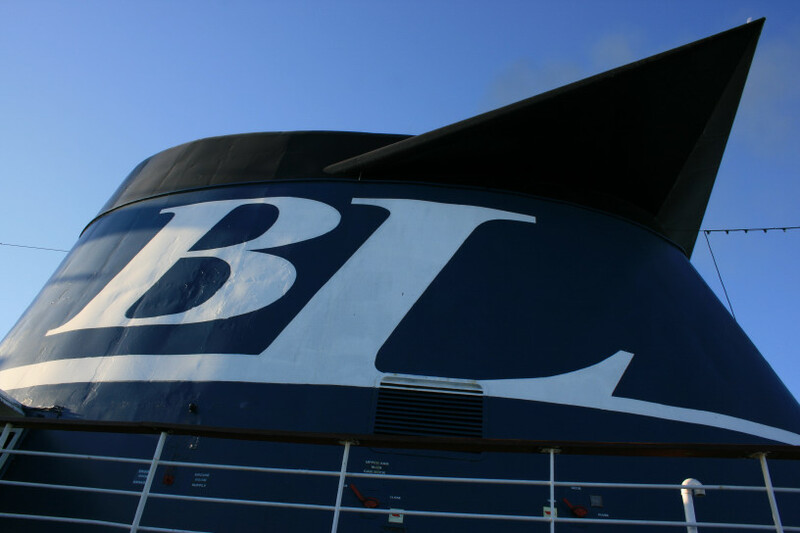 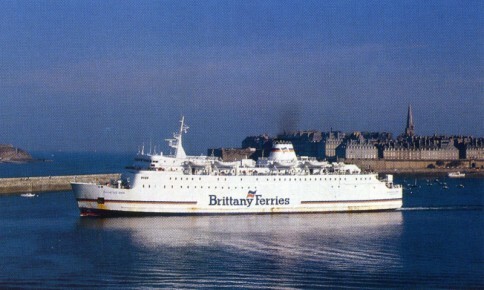 B&I’s financial position forced the sale of the Connacht at the end of that year, with Brittany Ferries acquiring her for St Malo-Portsmouth sailings. After less than a decade with the French company, during which she saw service for a period back to her Cork birthplace on sailings from both St Malo and Roscoff, she was disposed of to Jadrolinija at the end of the 1996 season. As the Duchesse Anne, at Saint Malo. I joined the ship for one of her domestic sailings from Stari Grad to Split in July 2007; this leg in particular, forming the return to Split after the theoretically through sailing from Ancona, is just another departure on this important route on which up to seven return sailings a day are offered in the Summer – generally in recent years the ex-Japanese Valun has been a mainstay. 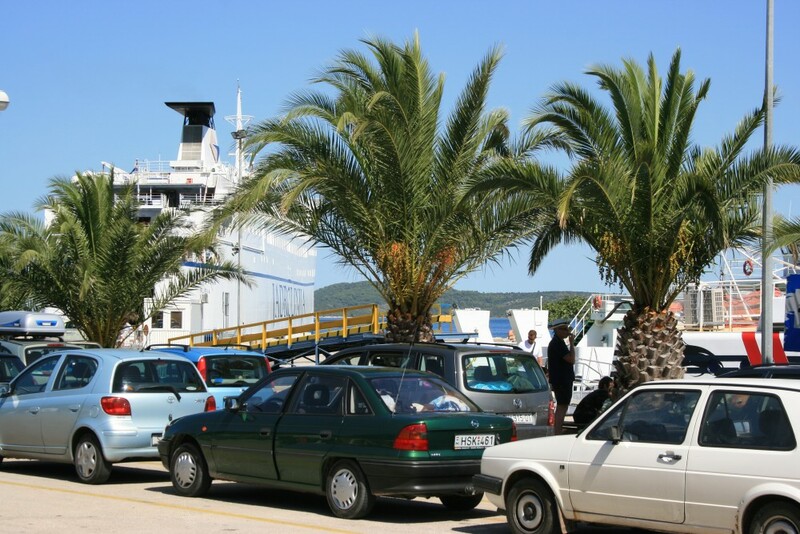 Stari Grad itself is a delightful place – overlooked by many of the guidebooks in favour of flashy Hvar Town on the other side of the island, it was originally a Roman settlement from the era of the Emperor Diocletian but was rebuilt with narrow lanes and defensive walls following the Roman collapse. 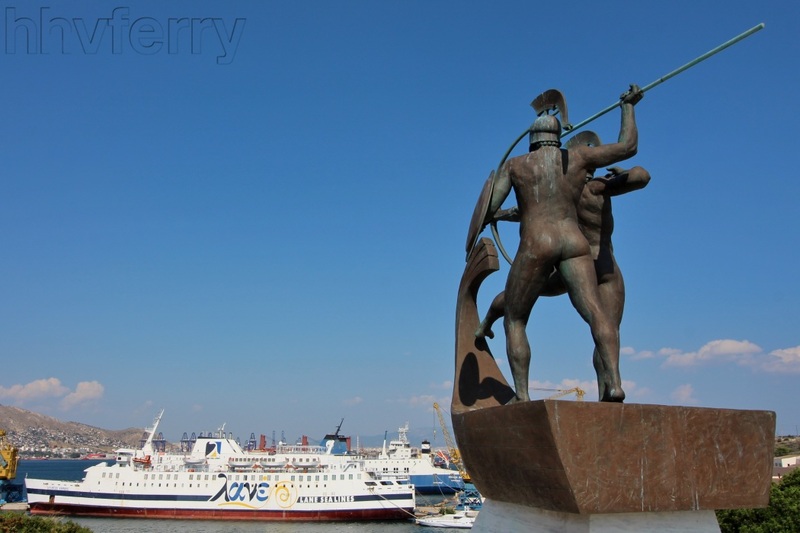 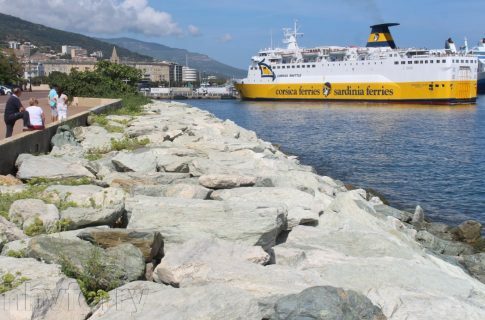 The ferry port itself is around a twenty minute walk along a shoreside pathway from the old town. On board, it is clear that little has changed aboard the Dubrovnik since her Duchesse Anne days yet the most important influence on the ship’s layout remains the refit given to the ship by B&I Line in Spring 1986. 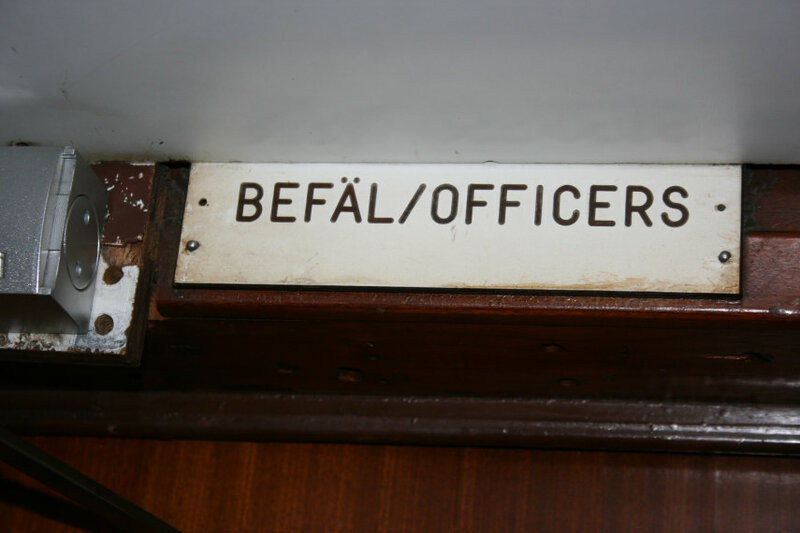 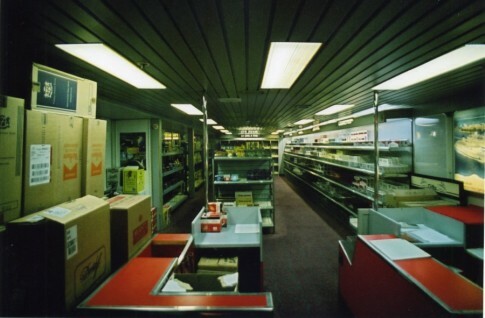 At just seven years old, it might have seemed somewhat early for the Connacht (and her even newer sister) to receive radical internal rearrangement, but circumstances had changed – conceived primarily as an overnight ship, the addition of Dublin-Holyhead sailings saw a change of emphasis with the main cabin deck (Upper Deck) being stripped out and an extensive new duty free shop, cinema and reclining seat lounges (“Super Rest Lounges” in B&I nomenclature) were added. 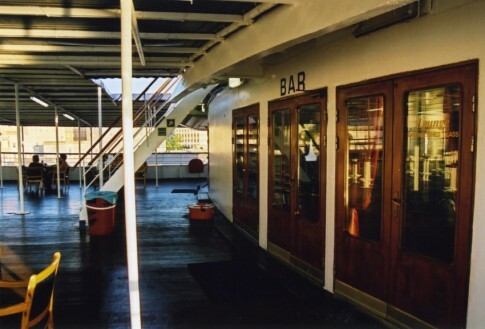 Upstairs on what was originally the Service Deck, the restaurant and cocktail lounge forward were swept away to become a new self service restaurant, and the original self service amidships on the port side became the new restaurant. 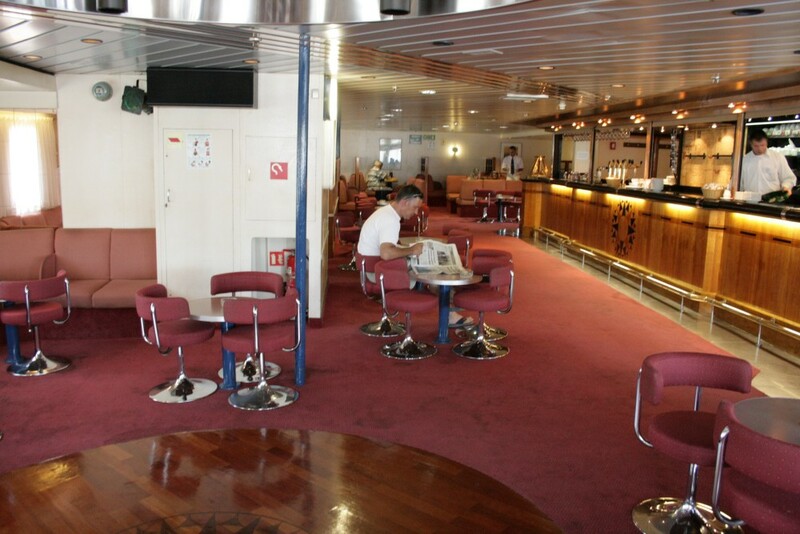 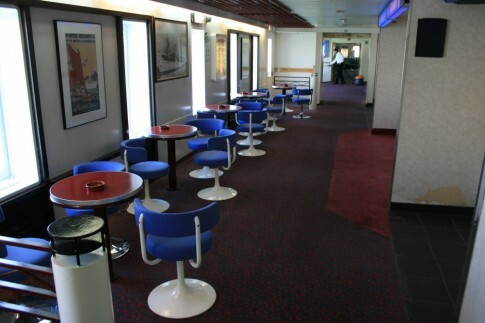 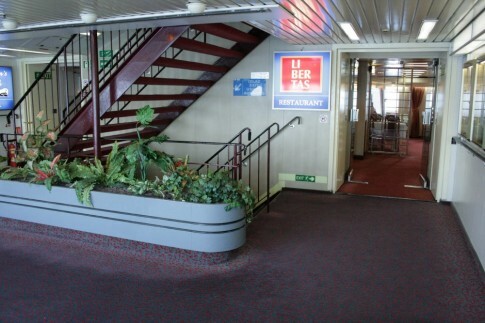 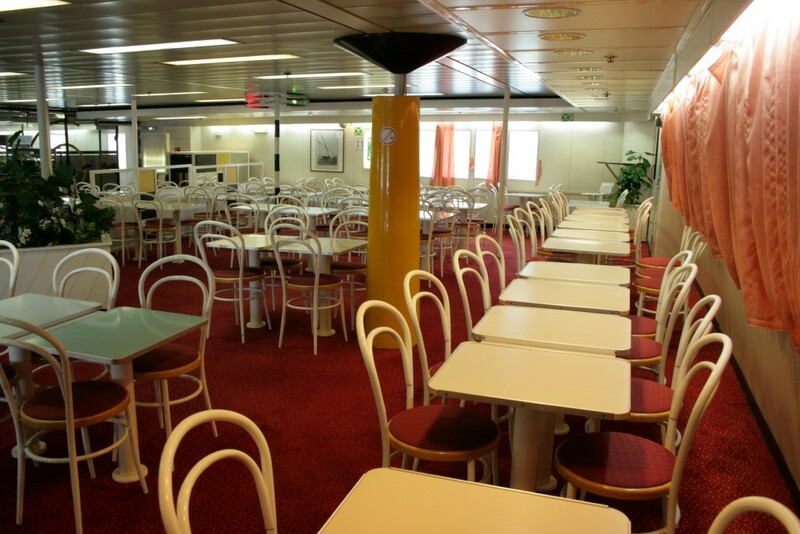 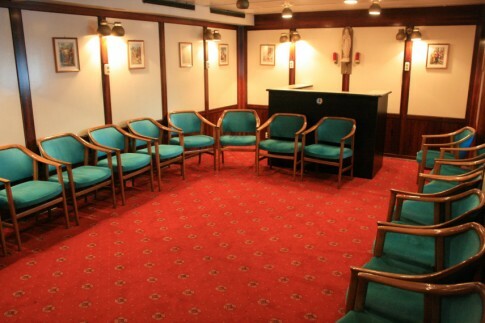 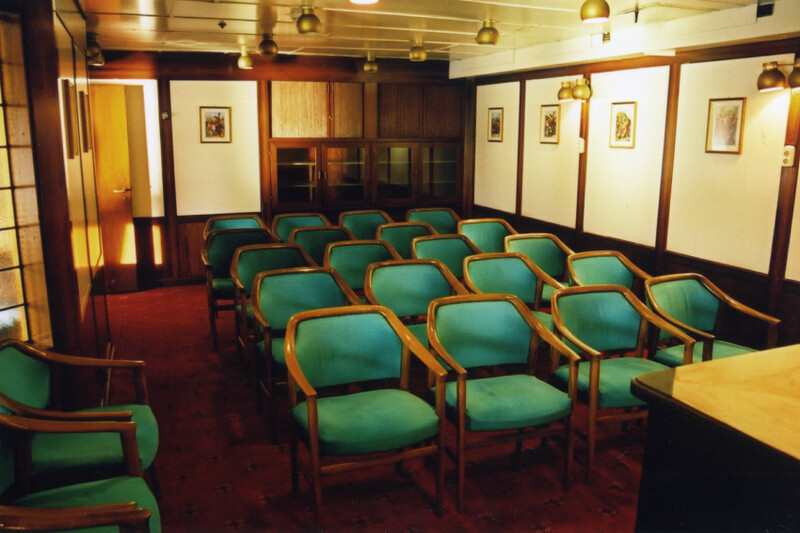 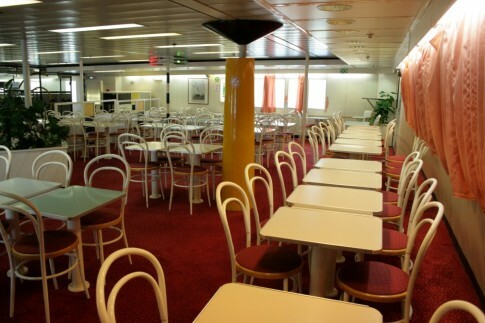 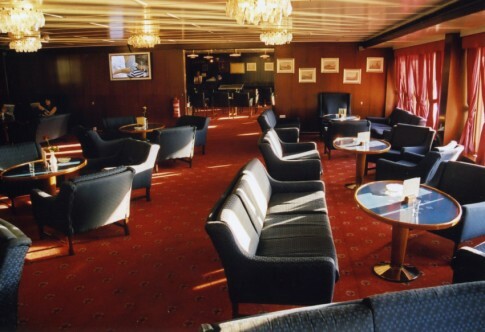 The £2m refit the ship was given before introduction by Brittany Ferries essentially retained this layout with certain areas receiving more attention than others – especially the self-service – whilst the newly-added Duty Free shop, aft on the Upper Deck (now the Information Deck), which had originally been a reclining seat lounge was replaced by additional cabins. 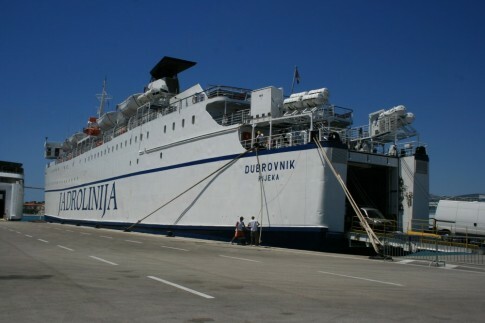 The Dubrovnik at Stari Grad port, seen from the pathway leading from the old town. 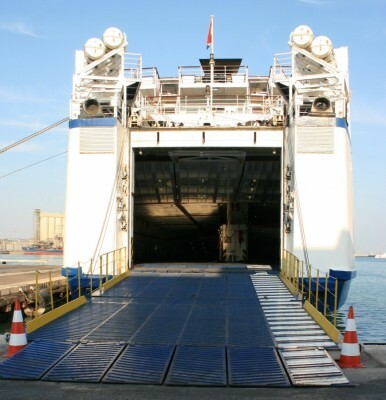 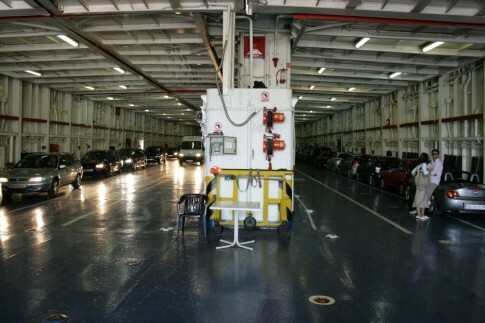 Boarding for foot passengers is over the vehicle deck. 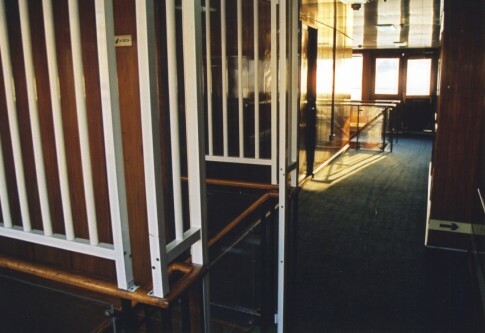 The lower of the two main passenger decks, latterly the Pont Information on the Duchesse Anne - this is the view looking aft along the centreline towards the information desk. Adjacent to the arcade seen above is the shop. 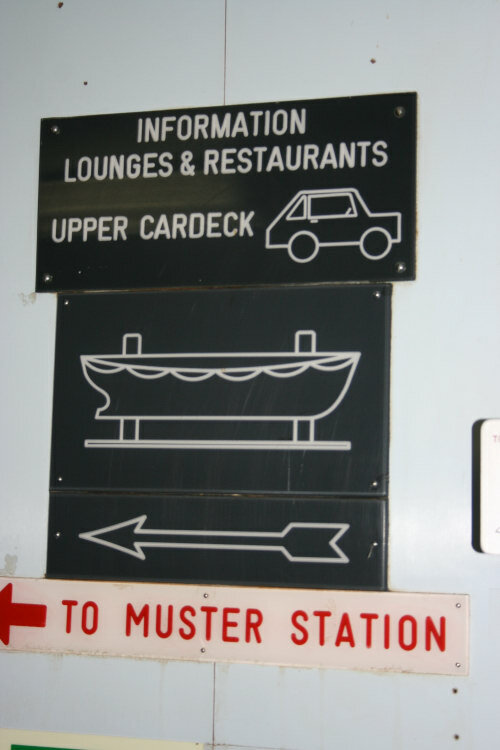 Moving forward, seen here are the staircases leading down to the car decks and lower cabin decks. 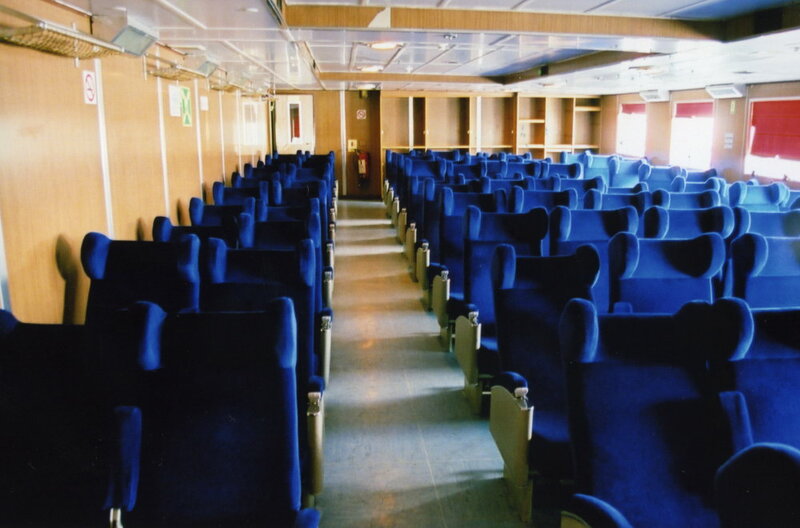 Right forward are a series of reclining seat lounges. 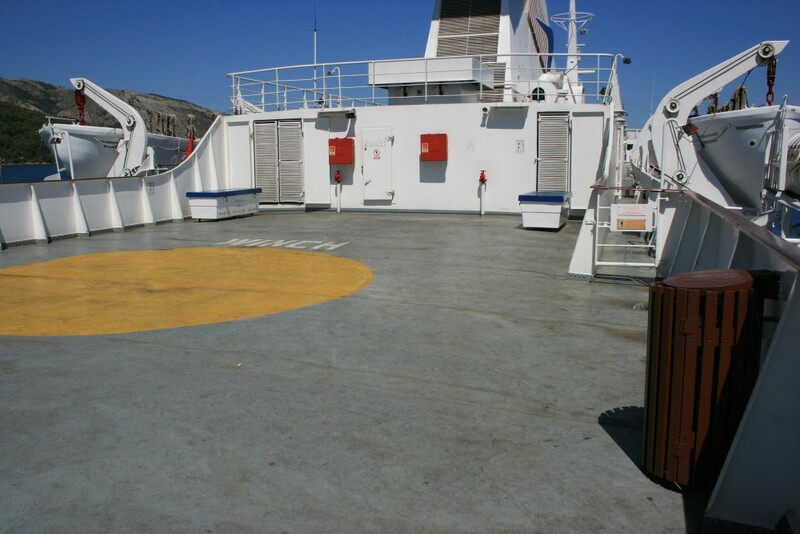 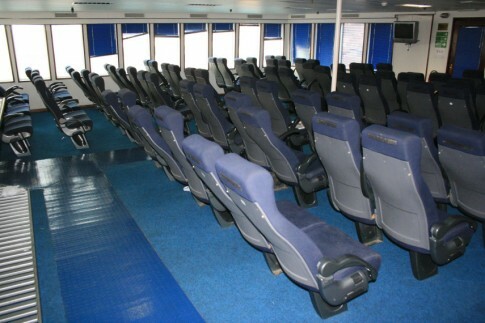 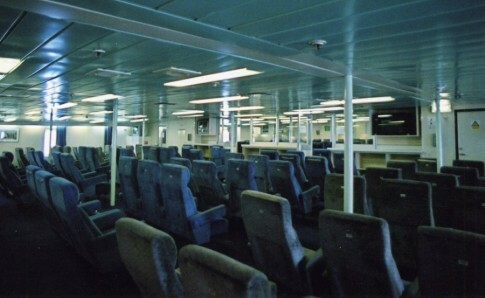 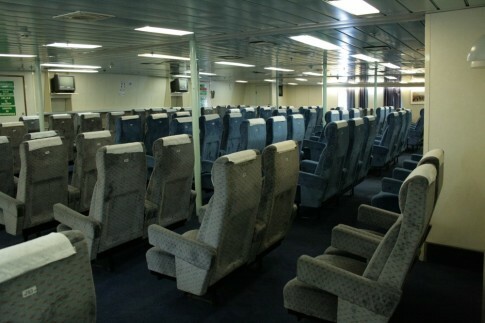 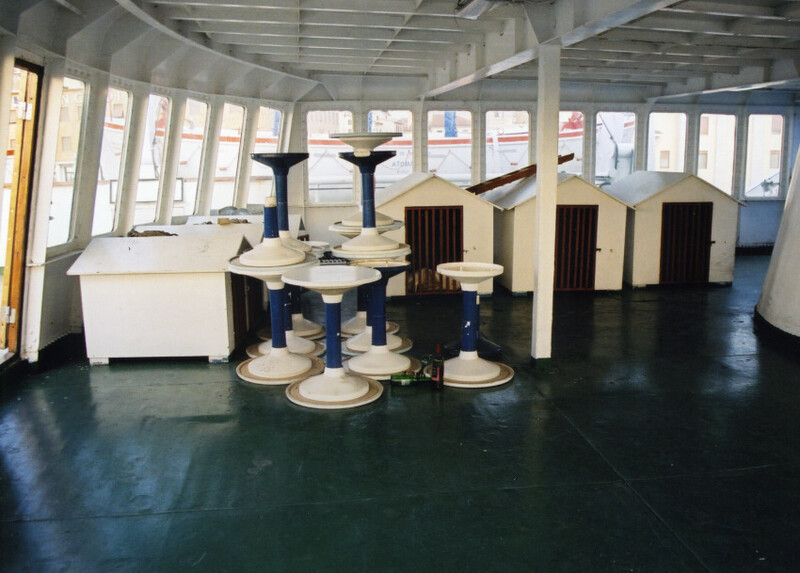 Originally this area contained cabins with four berths and a washbasin; on day sailings the upper berths could be folded away and the lower berths converted into broad settees for six passengers. 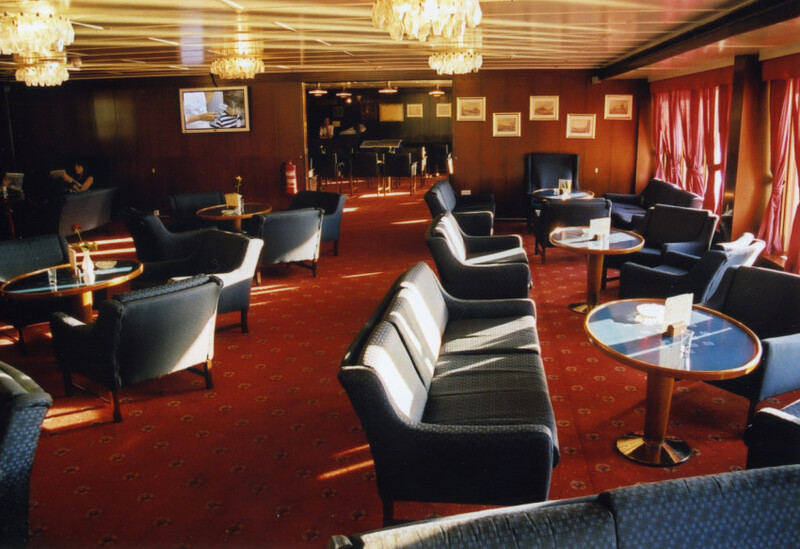 The area was originally converted to reclining seats by B&I Line in the 1986 refit, and has been retained as such ever since. 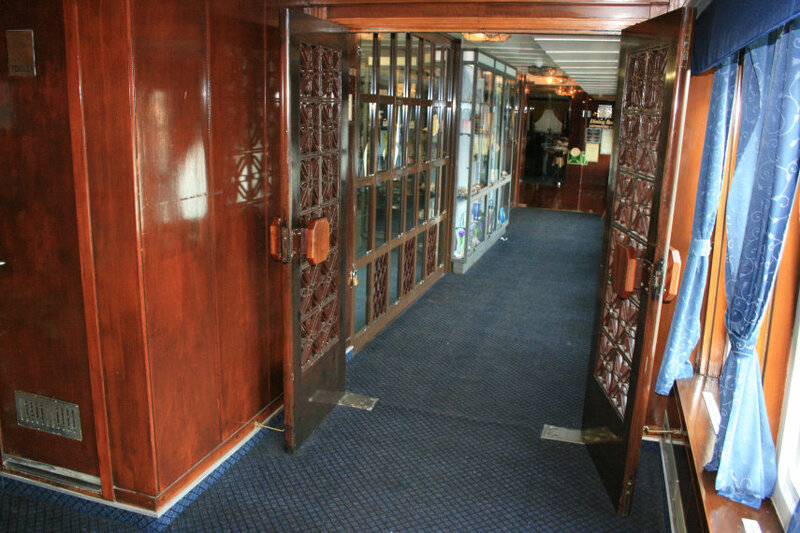 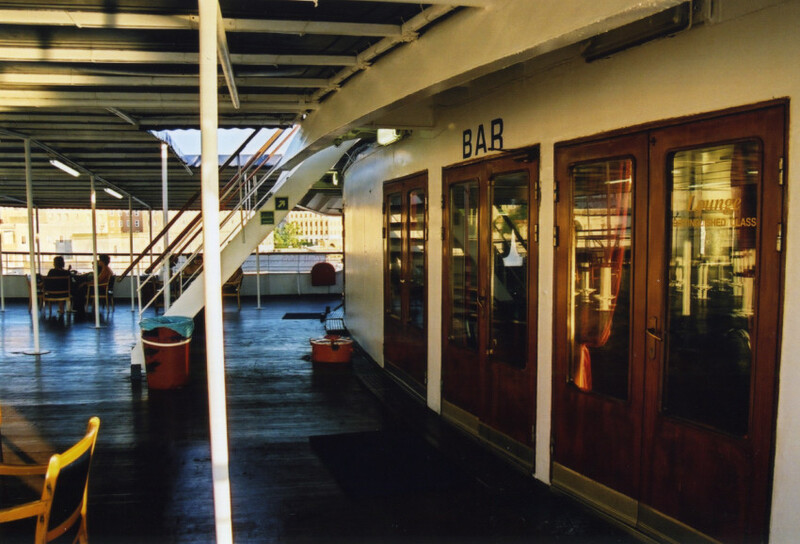 Moving up to the main saloon deck, right aft is the bar, 'L'Astrolabe' in the Duchess Anne days. This bulk of this area is actually not significantly changed since the later Irish Sea days, including details such as the furniture and the dance floor (below). On the starboard side of the space, Brittany Ferries added 'Le Glacier', selling ice creams, ably assisted by a decorative parrot. Moving forward along the starboard-side arcade, seen here is the entrance to Libertas Restaurant (formerly 'Le Nouveau Monde' on the Duchess Anne, but originally the location of the self service cafeteria). 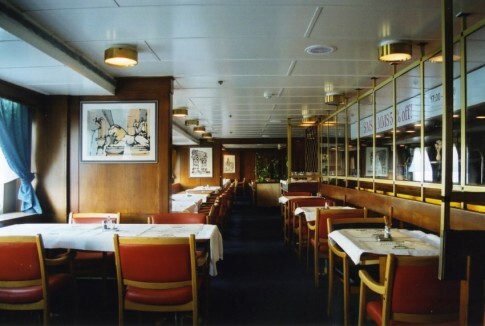 The restaurant - looking forward. 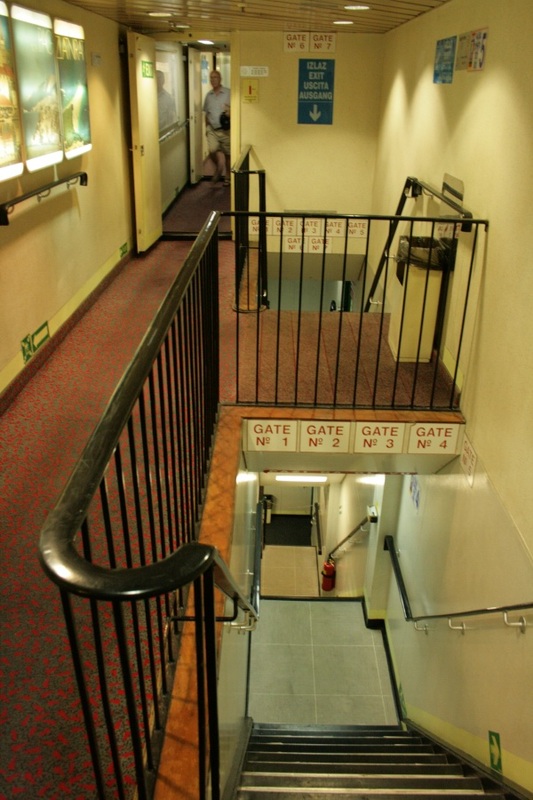 Continuing along the arcade - originally on the Connacht this was lined with fixed airline-style seating. Amidships is the former Viennoiserie 'La Licorne' (The Unicorn), still in use as a snack bar today. 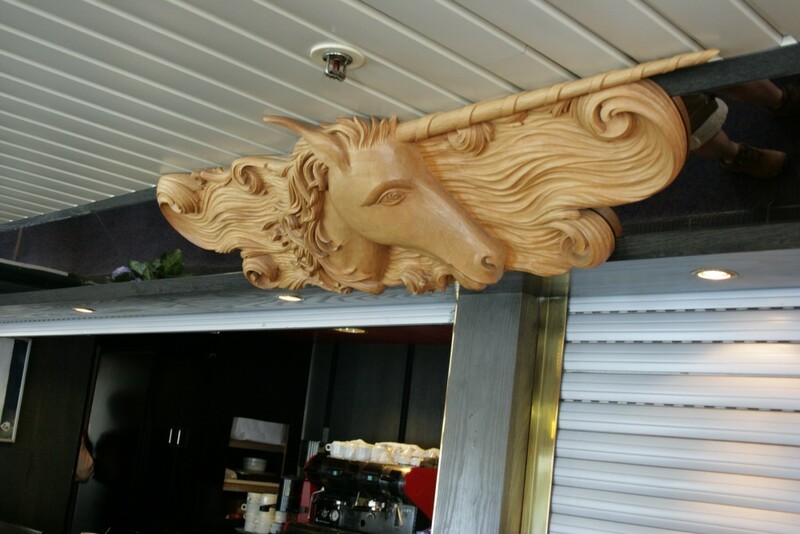 The carved unicorn head above the servery - similar in style to the carving above the bar counter on the former Duc de Normandie in her aft bar. Right forward is the self service restaurant - this is the view looking across to port. 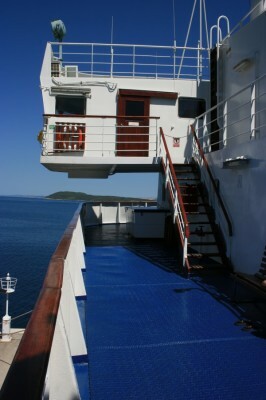 Looking aft to starboard - with the small children's play area visible on the left. 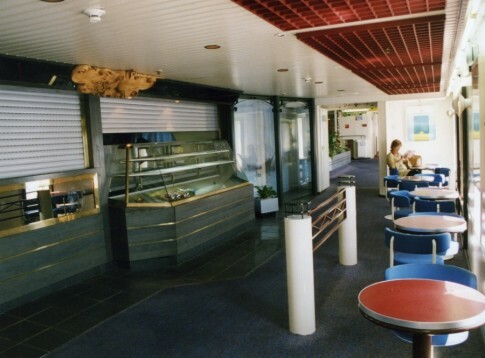 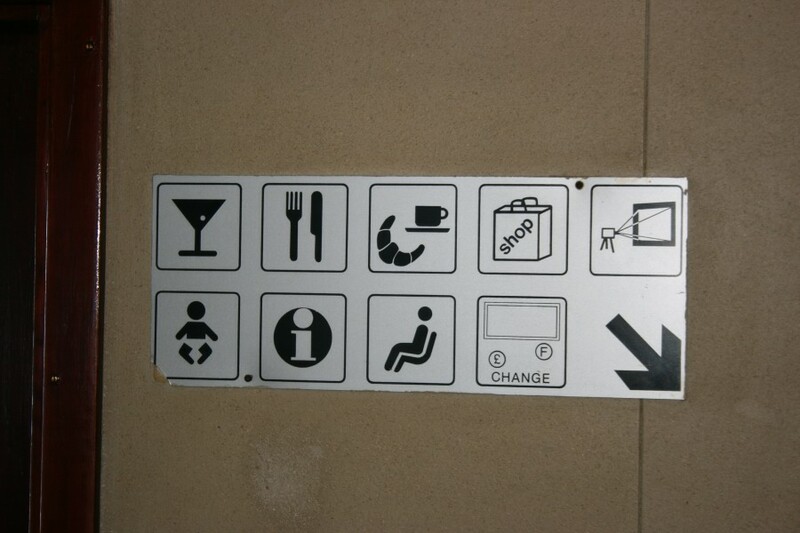 The servery area is to port. 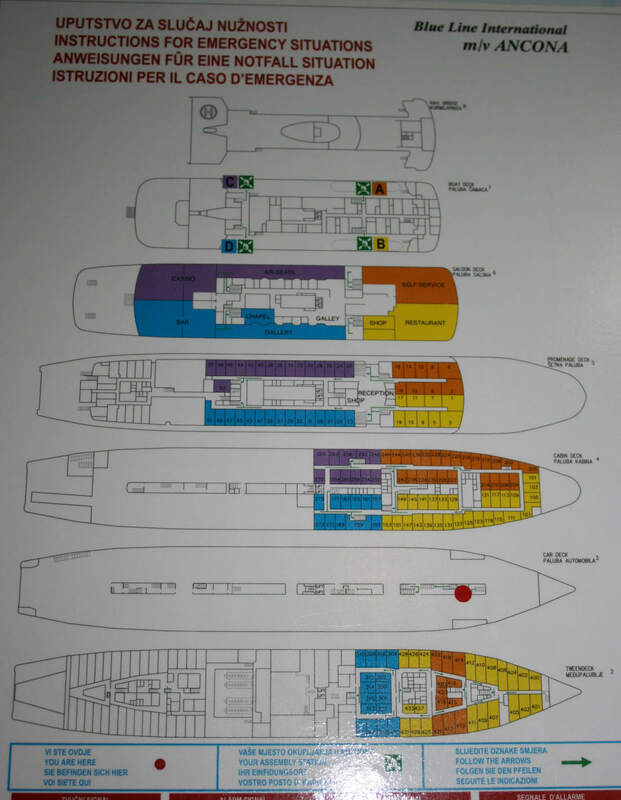 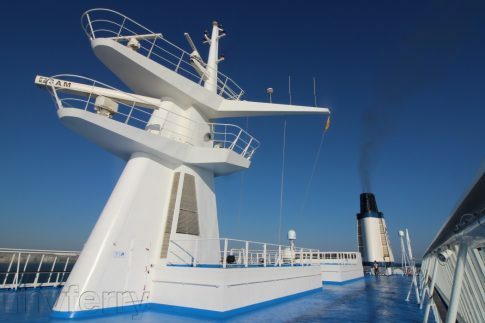 The uppermost passenger deck retains the original layout with crew accommodation forward and to starboard, with 16 passenger outside cabins to port (above) and a reclining seat 'observation' lounge aft, surrounded by a full promenade deck. 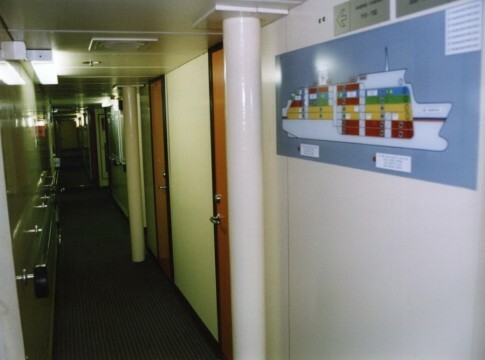 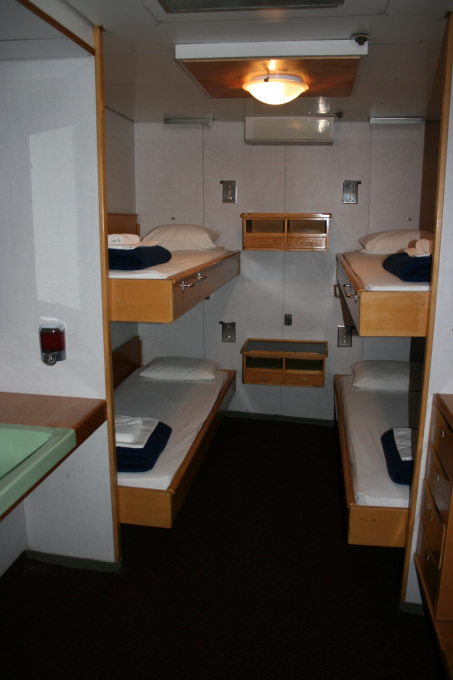 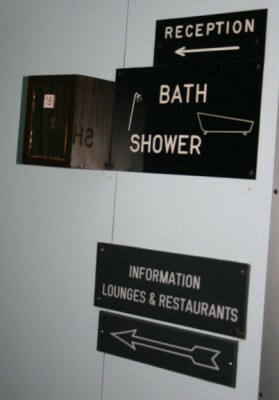 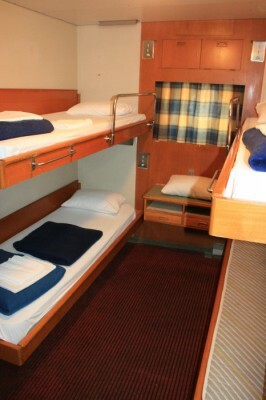 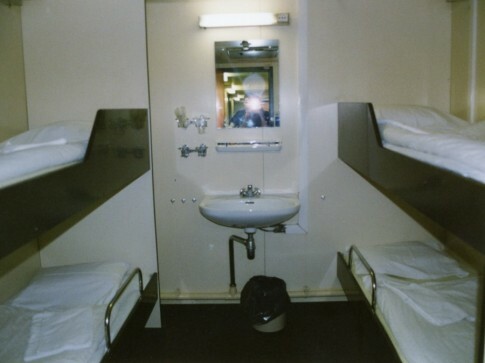 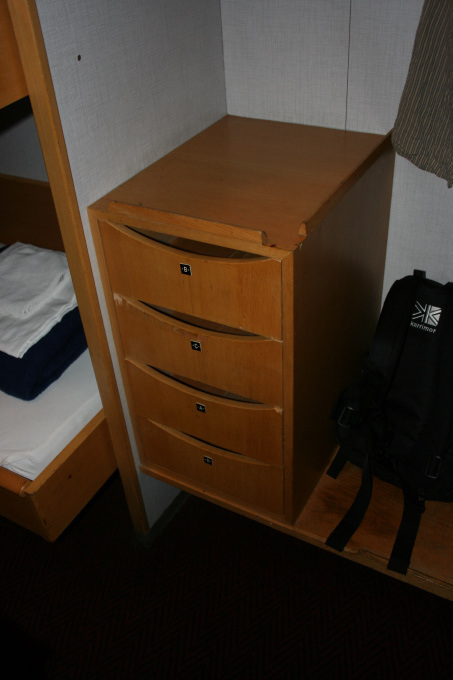 As built, those 16 cabins were the only ones with en-suite facilities. 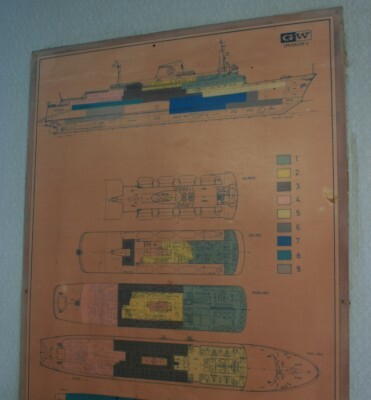 A Duchesse Anne-era deckplan. 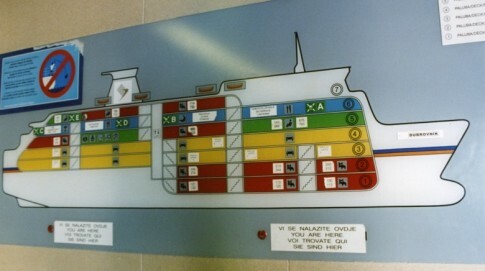 These have subsequently been replaced by Jadrolinija plans. 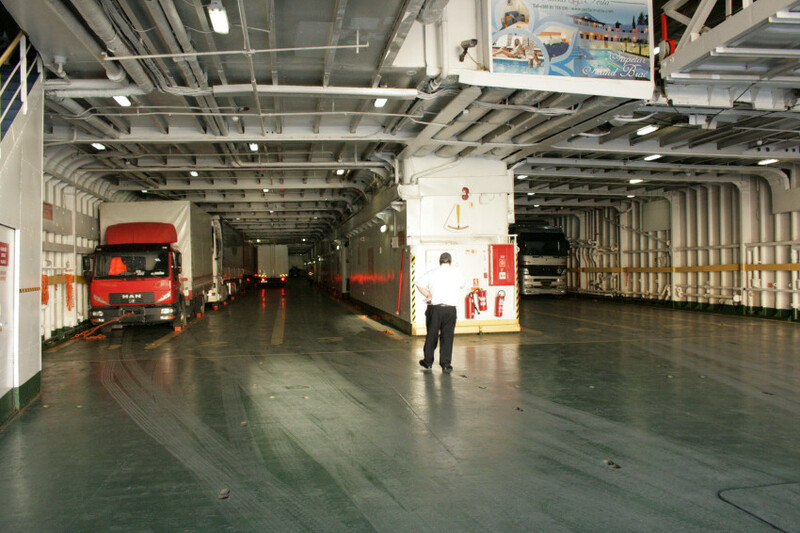 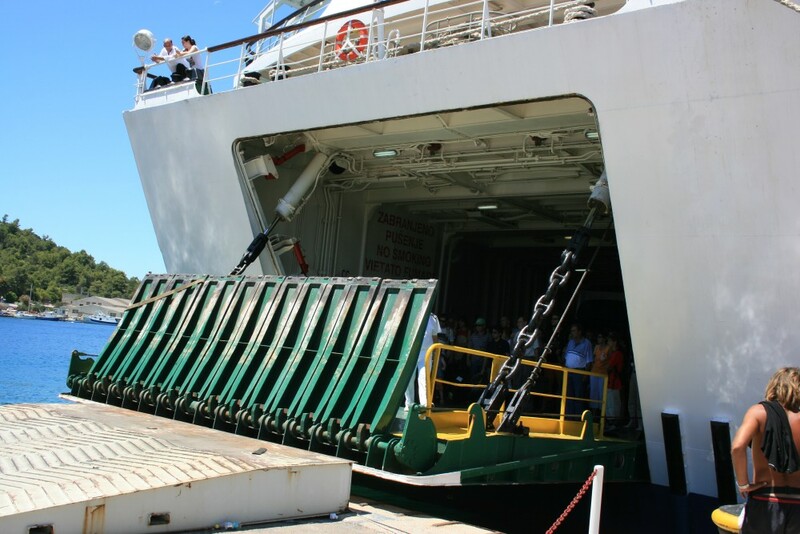 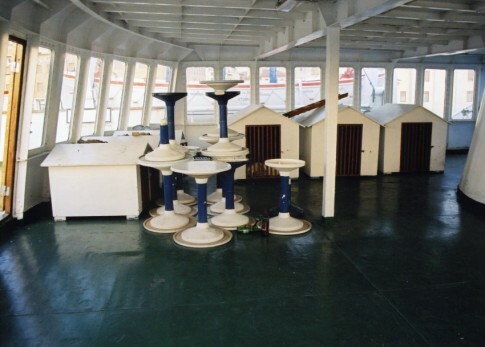 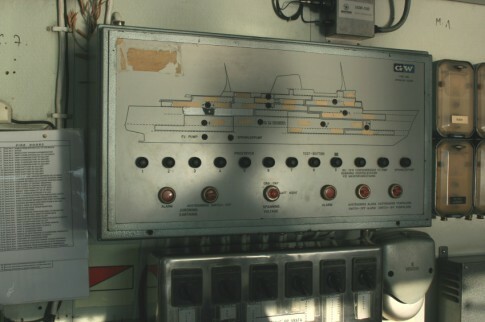 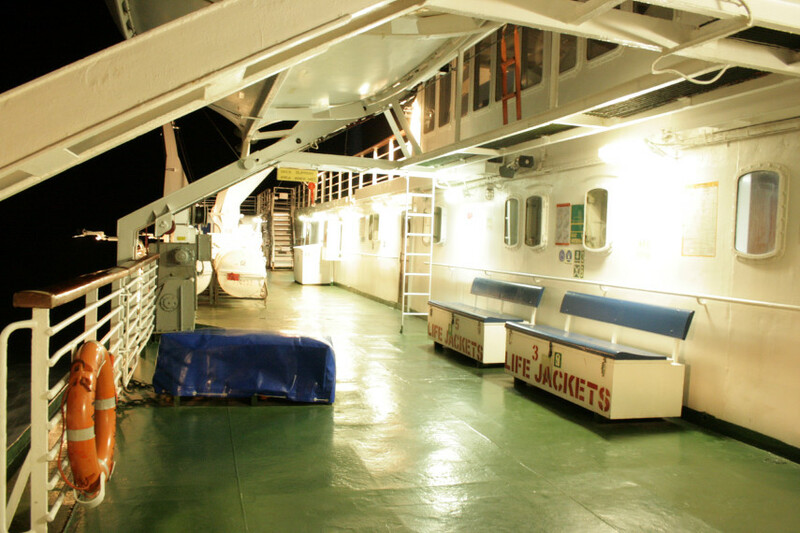 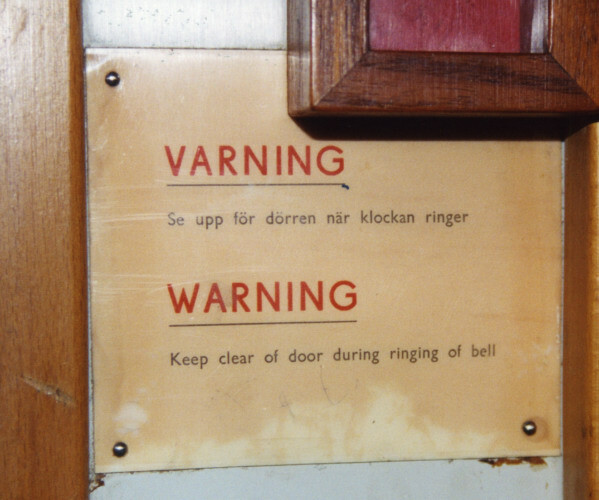 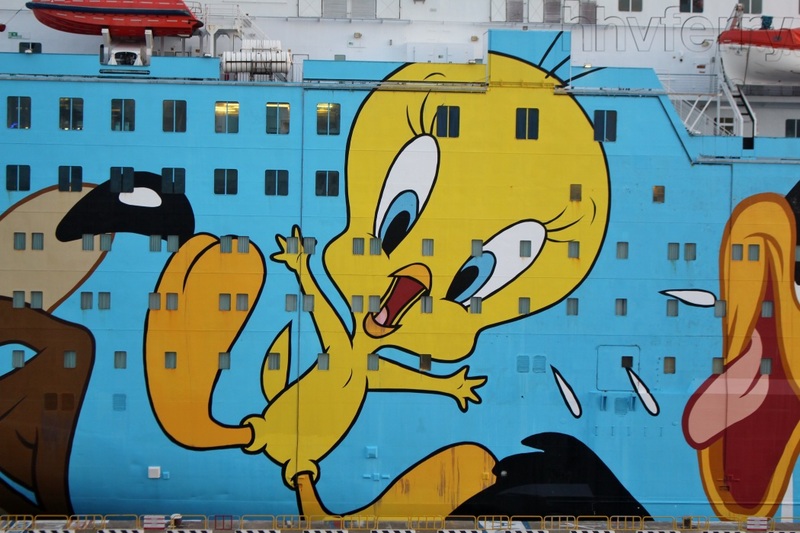 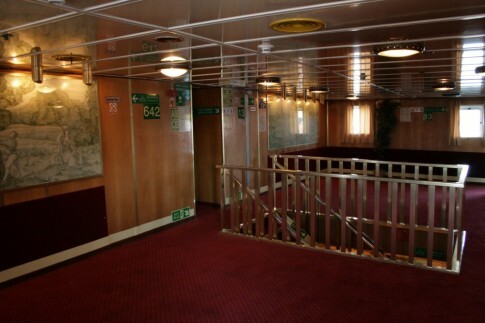 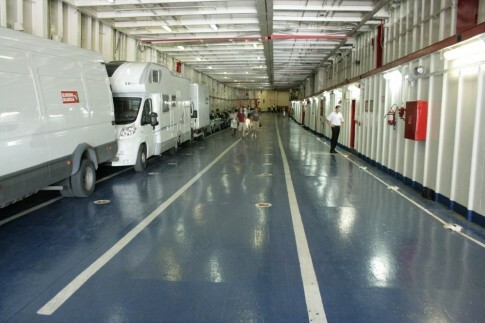 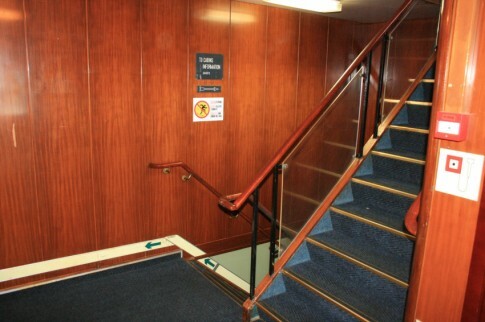 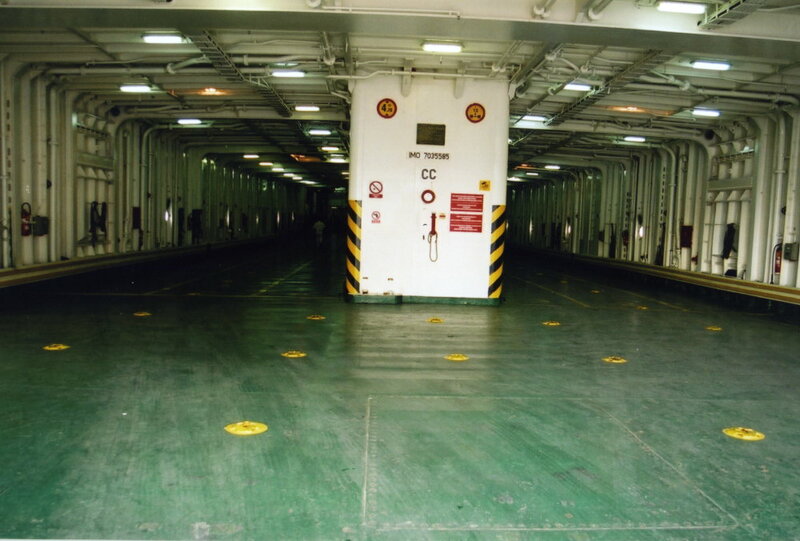 On two decks beneath the vehicle deck, the ship retains her original cabins without facilities. 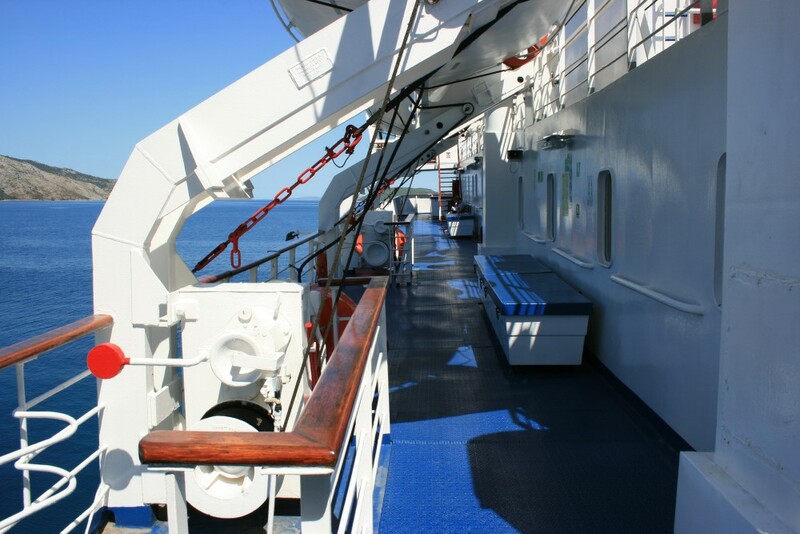 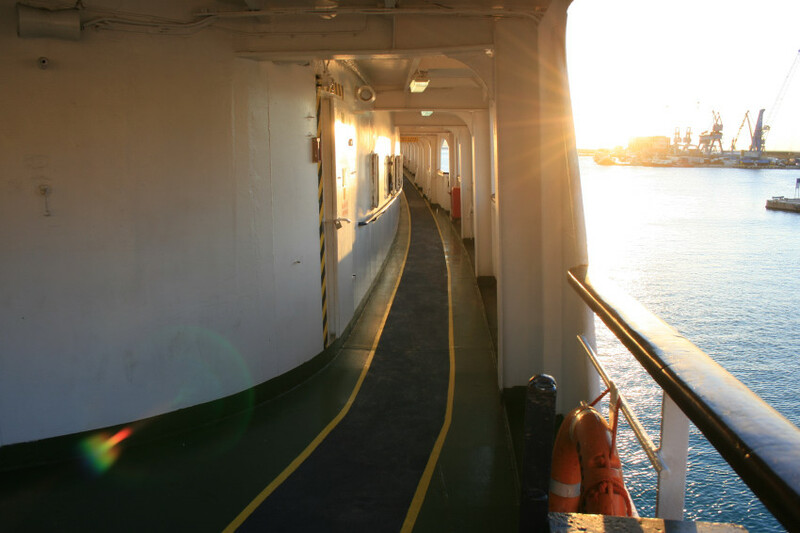 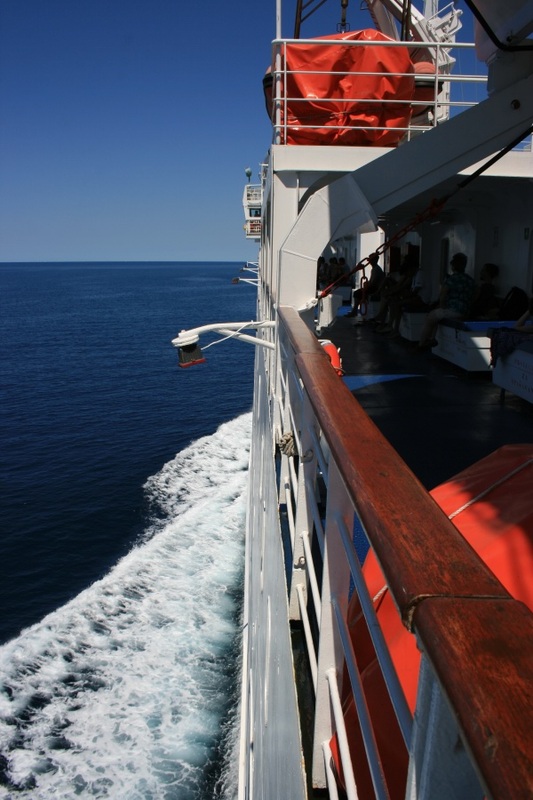 The promenade deck, looking forward. 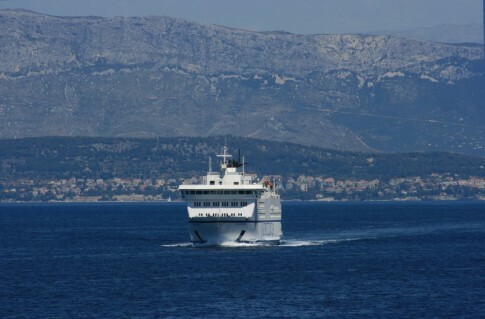 Passing the Petar Hektorovic (ex-Langeland III) off Split. 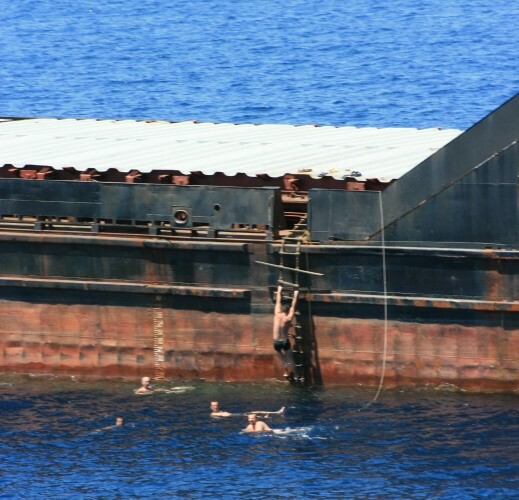 Just outside Split harbour entrance, the crew of the Georgian freighter Valentino go for a swim. 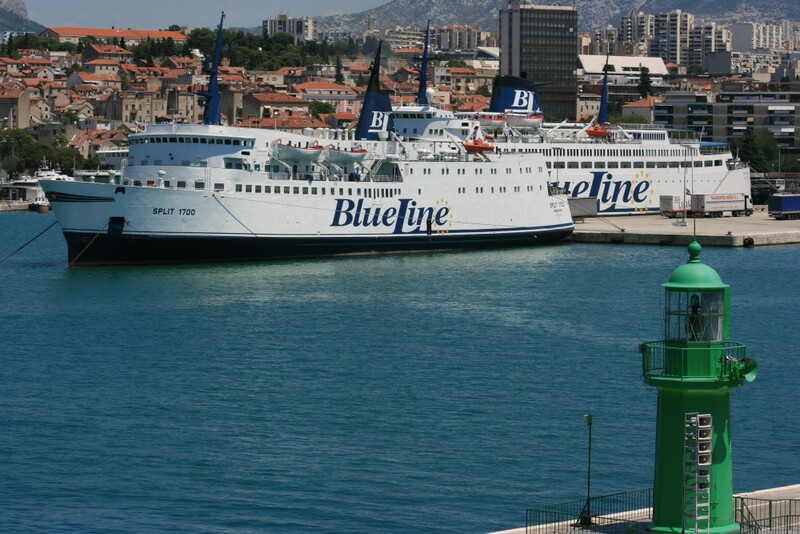 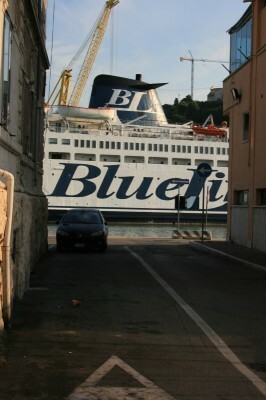 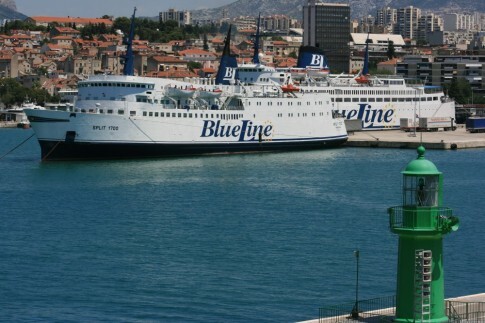 The Blue Line fleet, the Split 1700 and the Ancona, unusually together in Split. 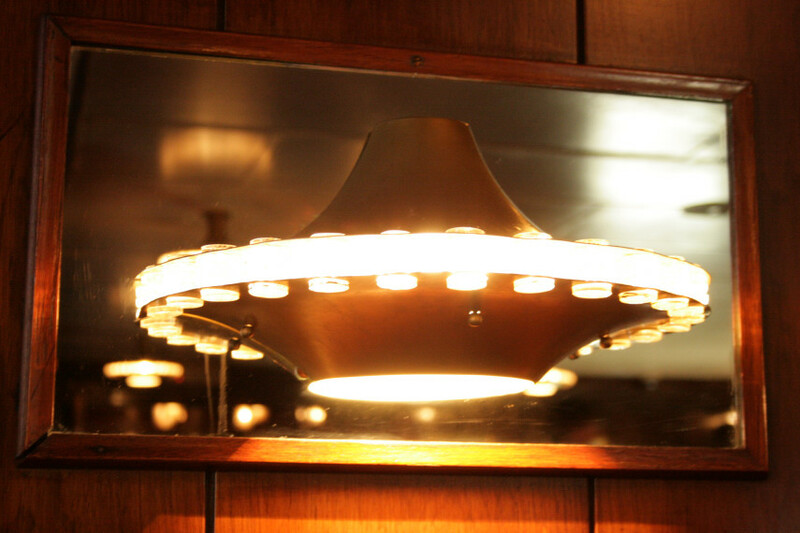 Time is running out for this contrasting but classic pair, both built in 1966. The 2004-built Supetar manouvering in Split harbour before a sailing to her namesake island. 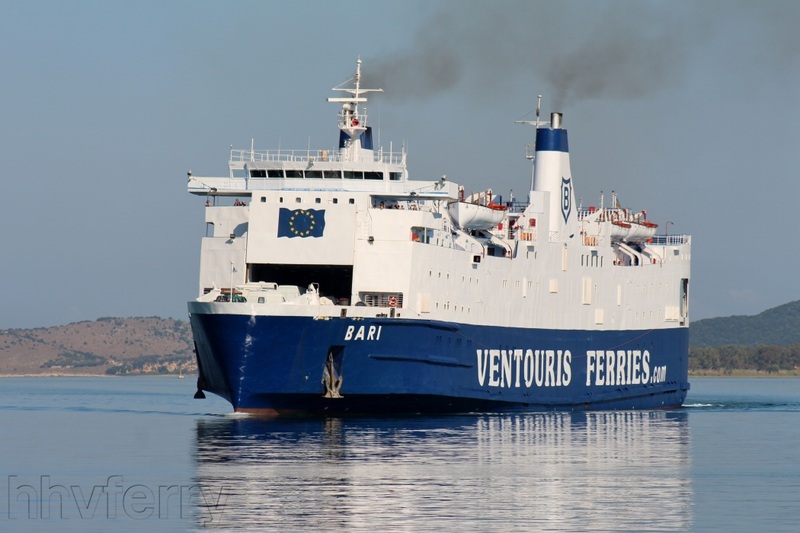 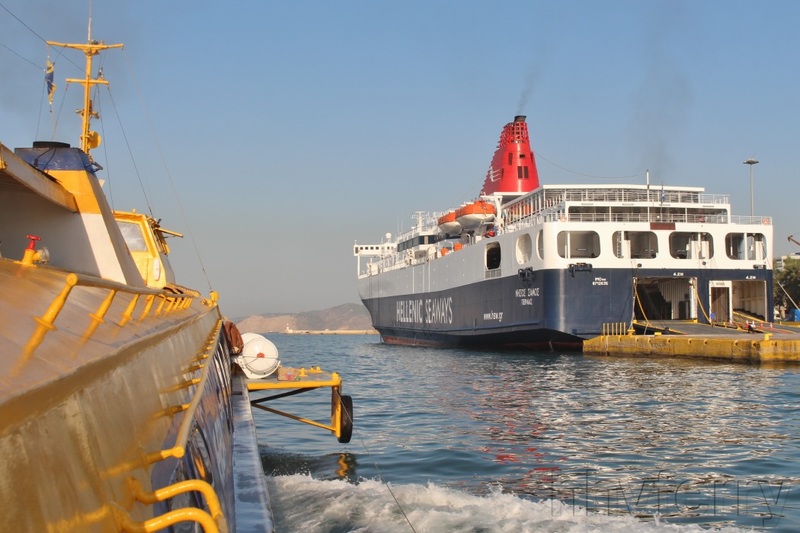 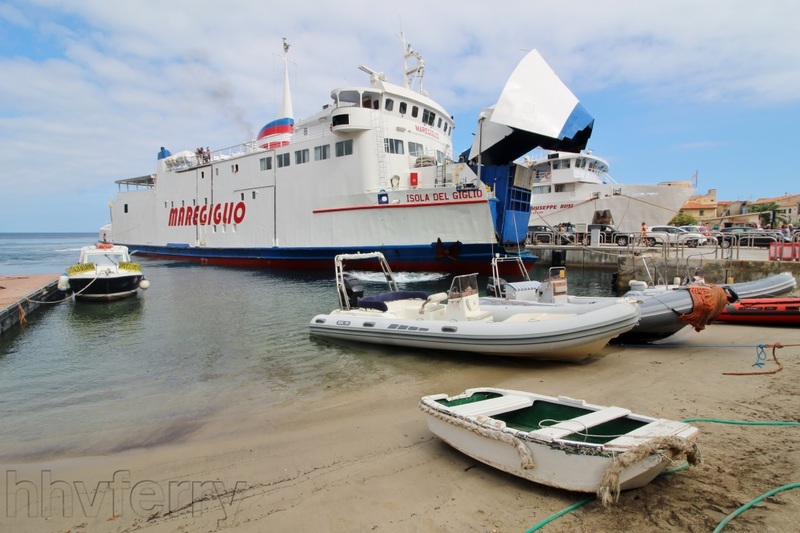 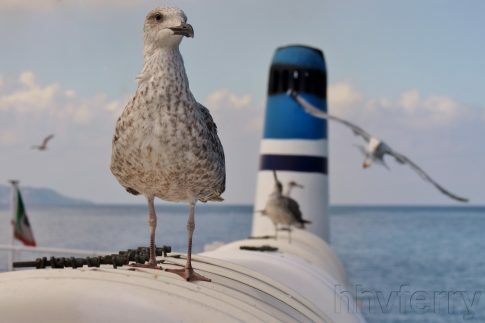 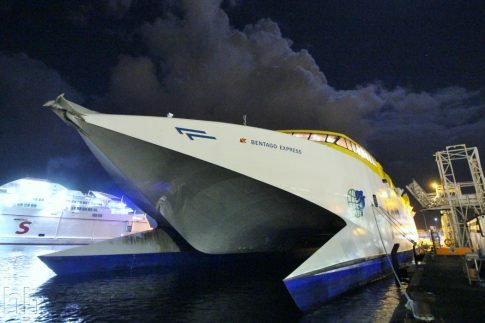 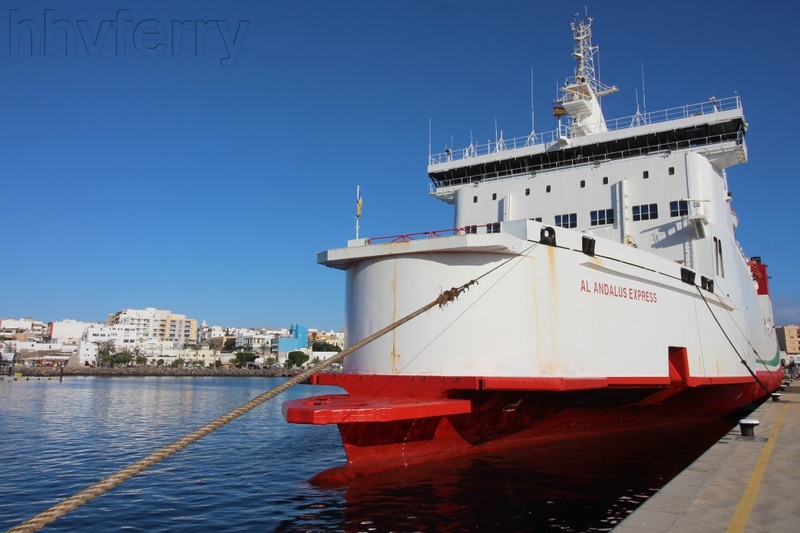 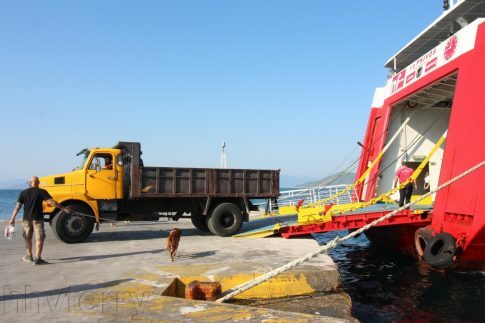 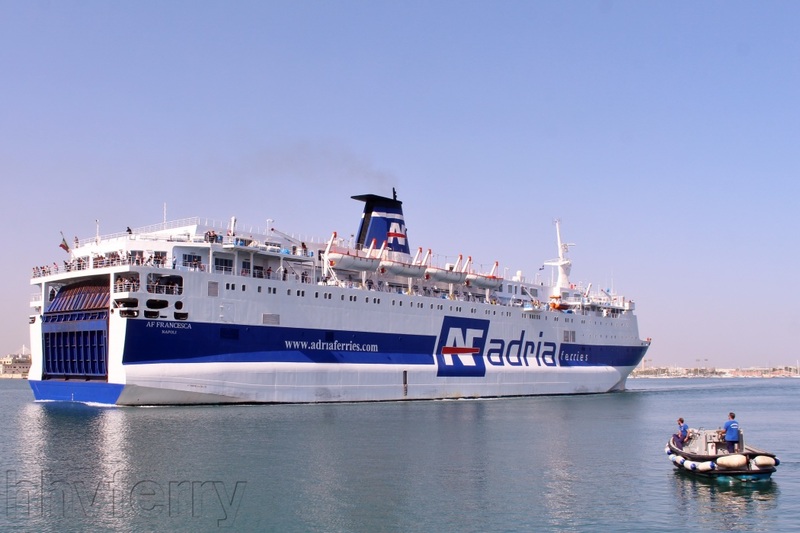 She has since been displaced by further new tonnage and in 2008 could be found operating on the busy Prizna-Zigljen (Pag) route north of Zadar. The Dubrovnik and Ancona seen from the Valun on our return sailing to Split later that afternoon. 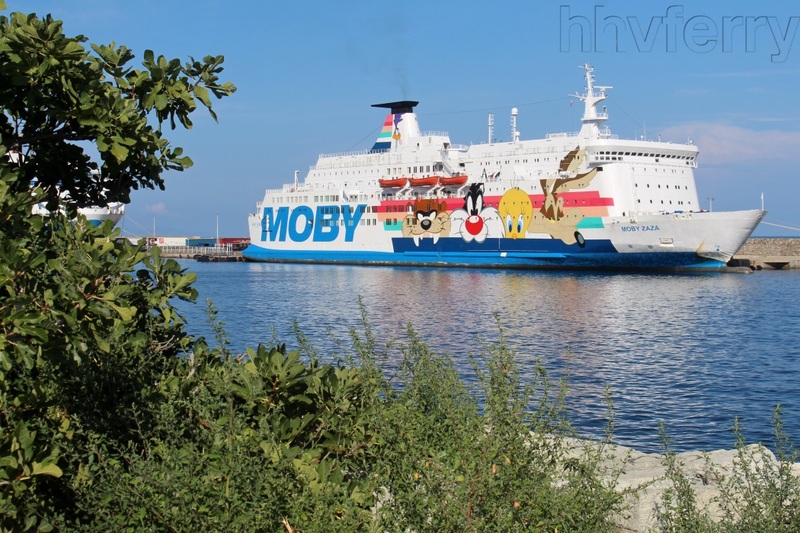 Also in harbour were the Split 1700 and the Istra (ex-Mette Mols) - a fascinating selection of classic ferries, each of interest in their own right. Jadrolinija’s coastal and international fleet, shorn of the Ivan Zajc, is now only three-strong. In the peak season the Marko Polo maintains what is now only a twice-weekly Rijeka-Dubrovnik-Bari service whilst the delightful little Liburnija ensures the Bari-Dubrovnik link is serviced six times in total, her four return sailings on the route being extended up to Korcula three times weekly (and to Split on Saturdays). 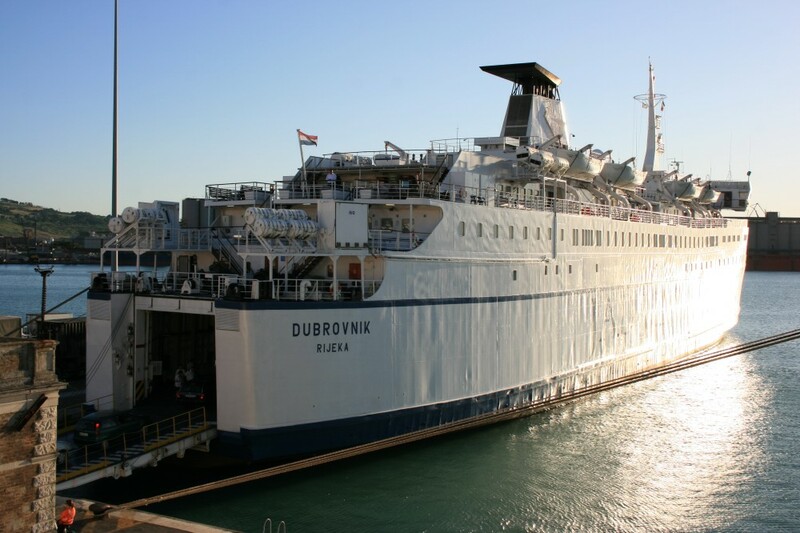 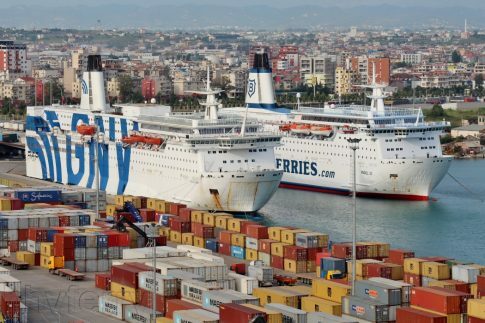 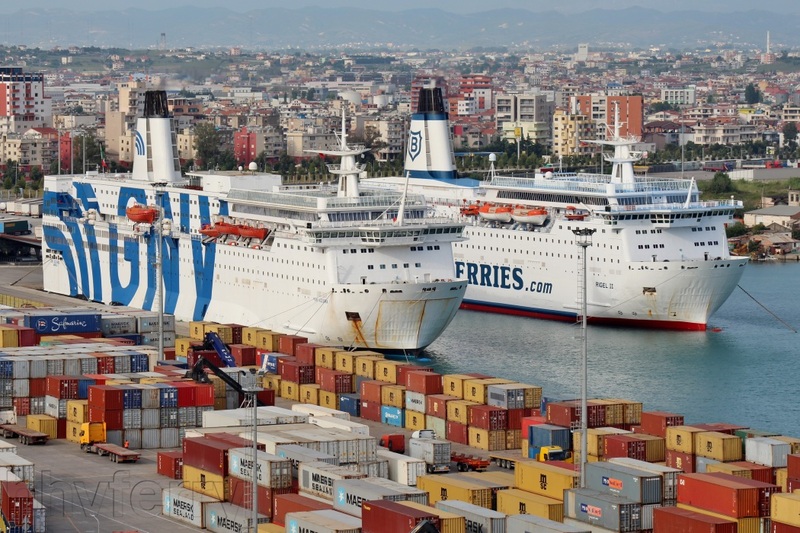 Despite being in generally excellent condition, the company has in recent years been thinking aloud about the need for newer tonnage than the current vessels, of which the Dubrovnik is the youngest. 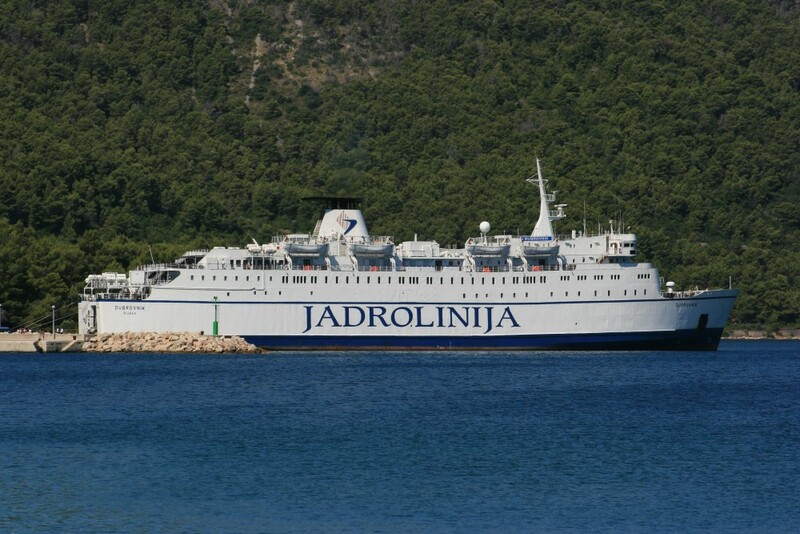 That still seems some way off however and it seems likely that the former Connacht will remain with the Croatian state operator for several years to come. 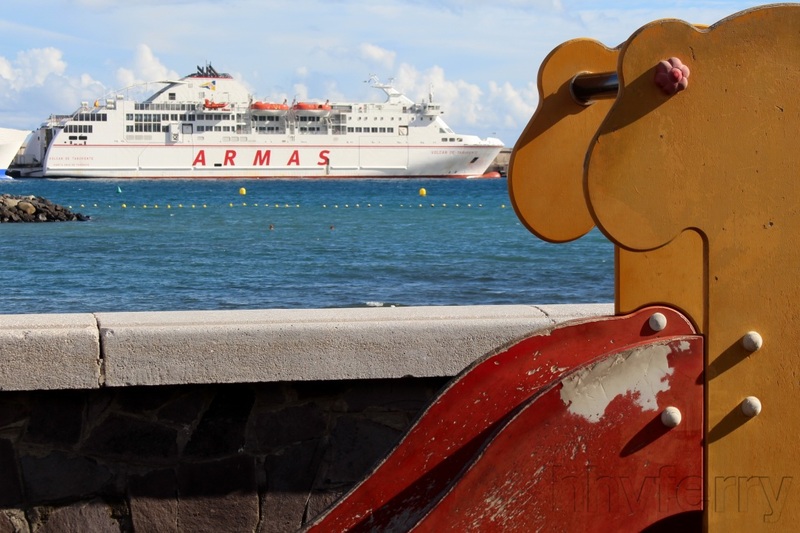 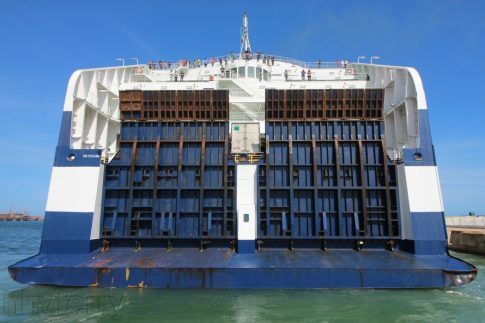 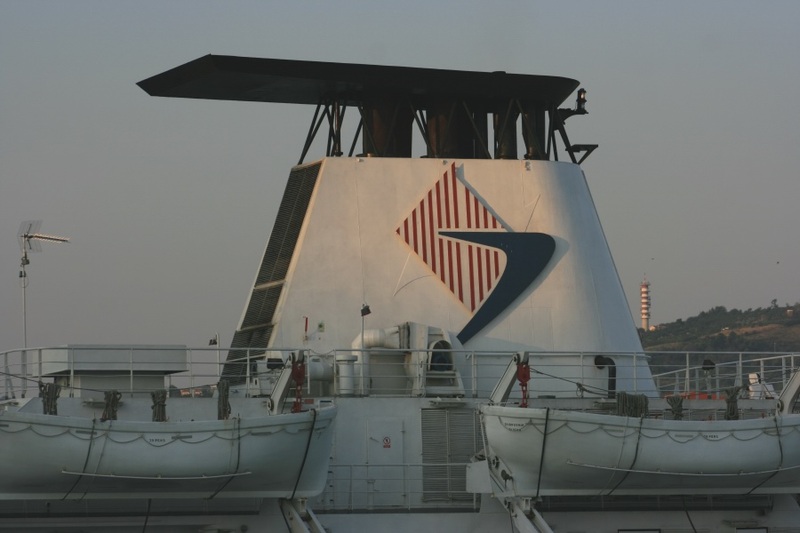 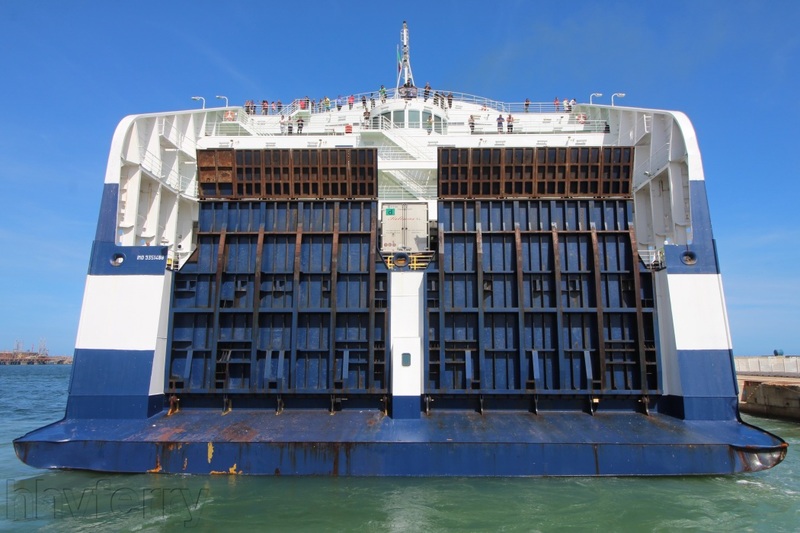 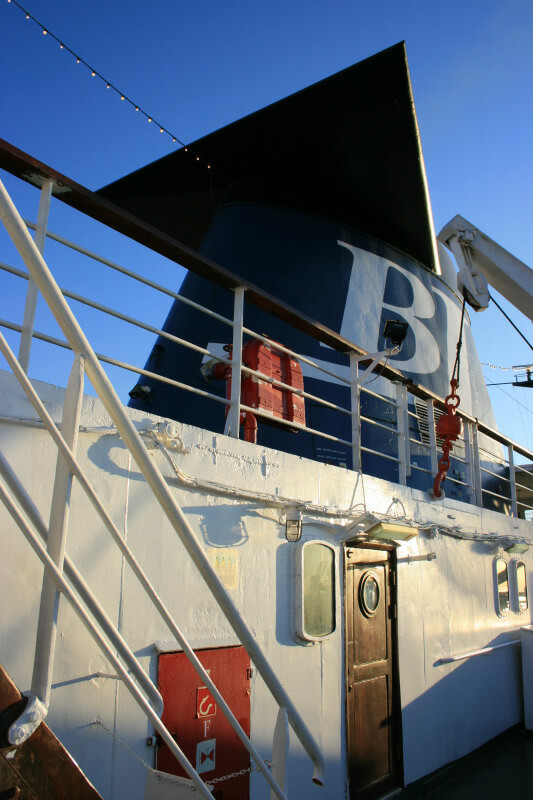 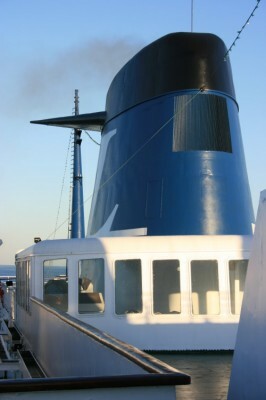 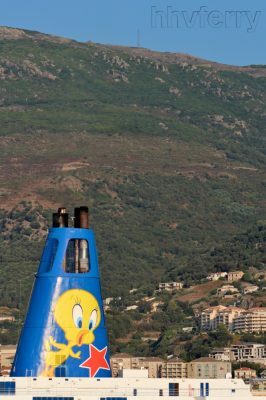 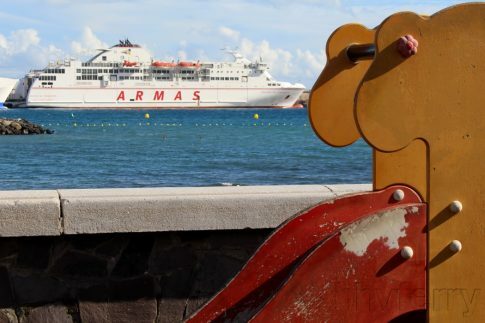 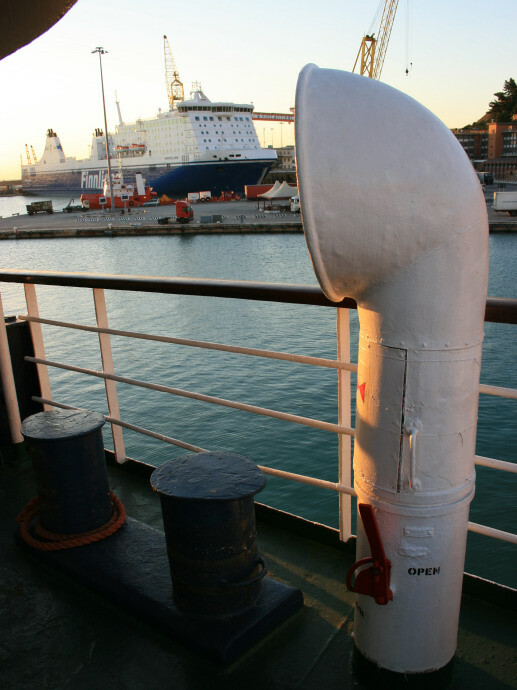 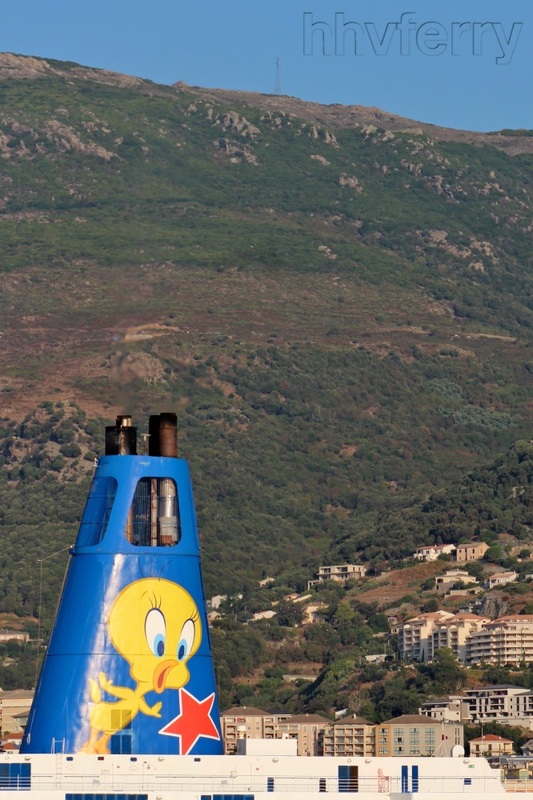 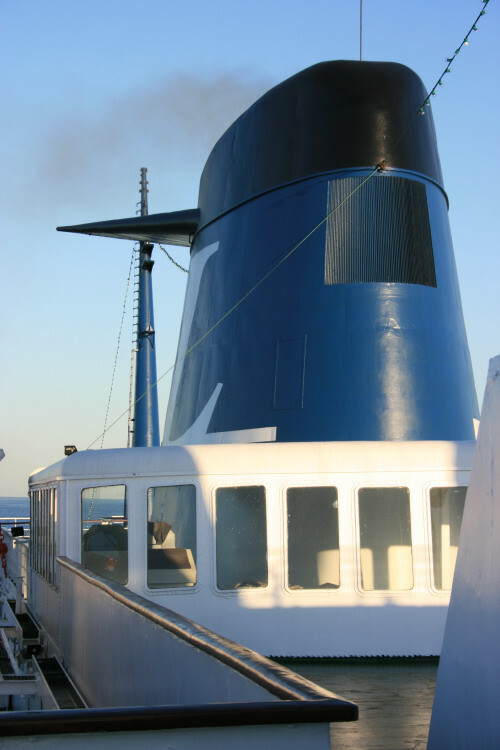 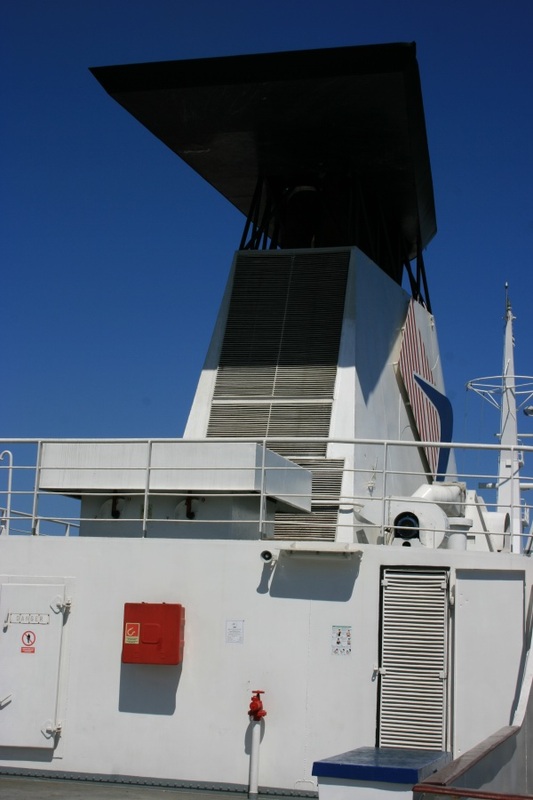 On the funnel, the Jadrolinija logo has been simply welded over the old Brittany Ferries one. 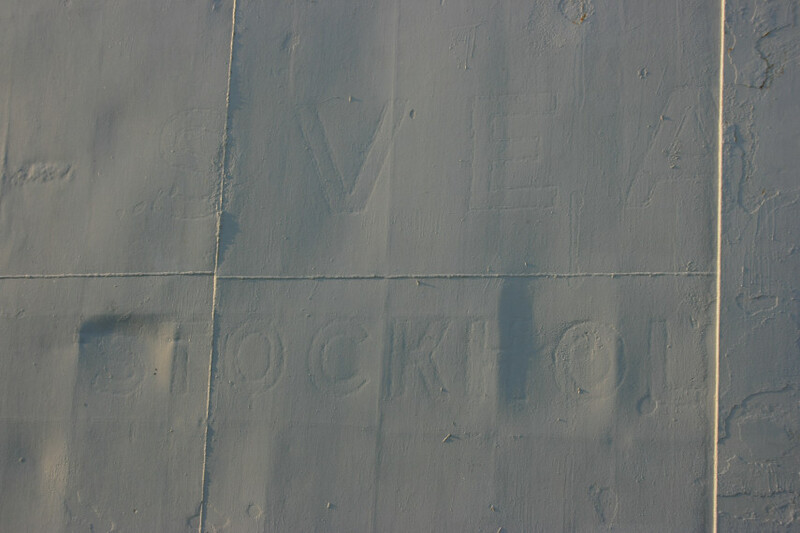 The old 'Duchess Anne' name is just about visible. The Dubrovnik at Ancona in 2008.